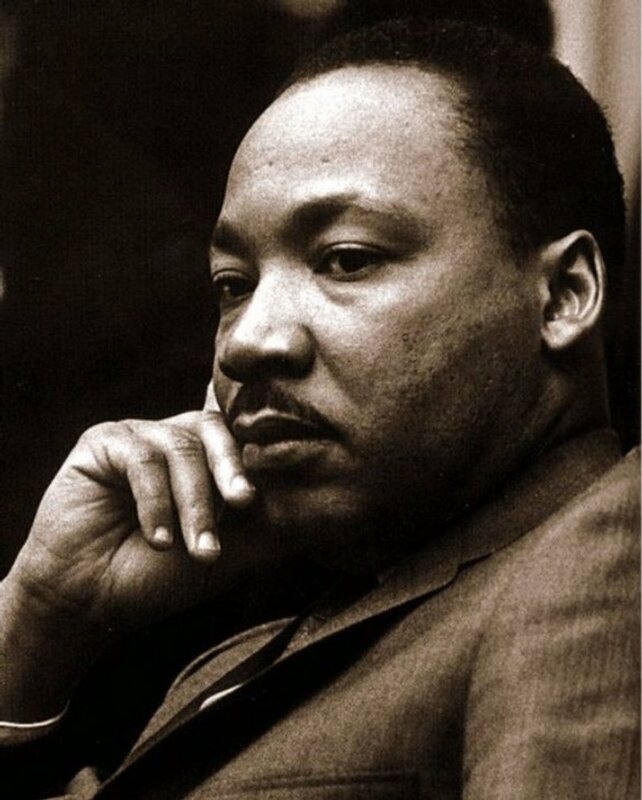 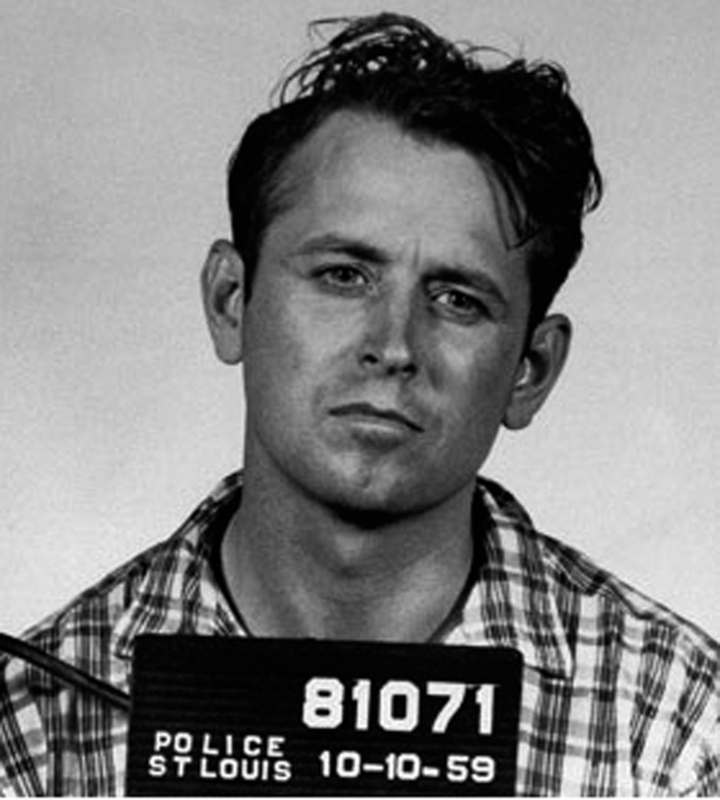 After the assasination of Martin Luther King in Memphis on April 4, 1968, James Earl Ray, the alleged assassin managed to evade capture and make his way to Toronto. 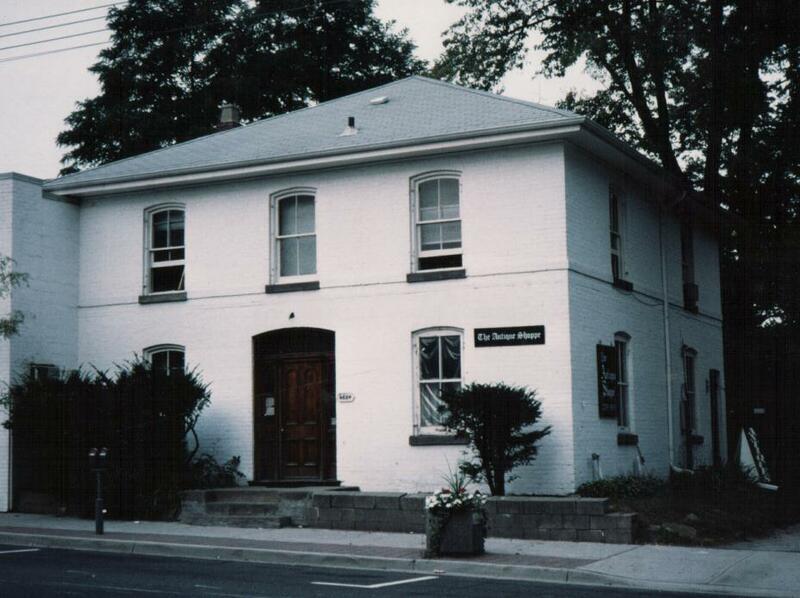 He spent the summer here biding his time before travelling to London England on a forged Canadian passport. 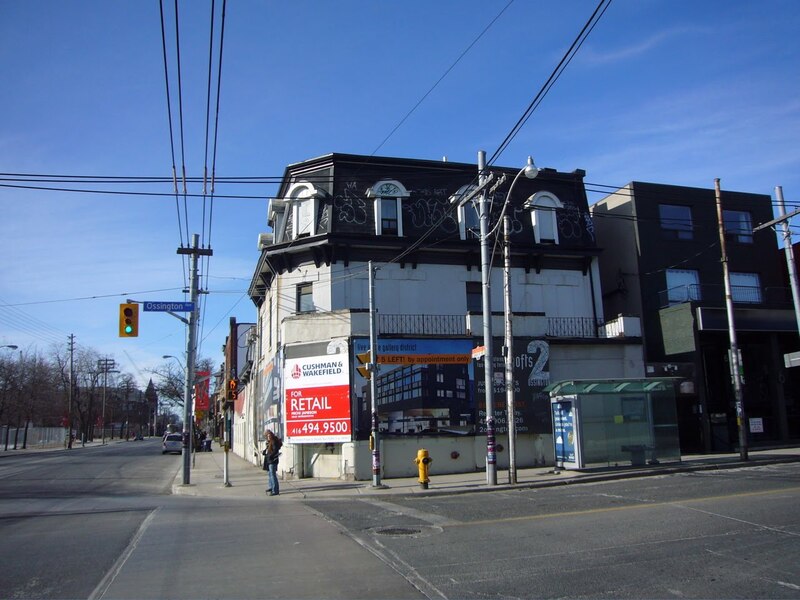 He first rented a room here on Ossington Ave.
between the two, telling one Landlady that he worked nights and the other that he worked during the day. 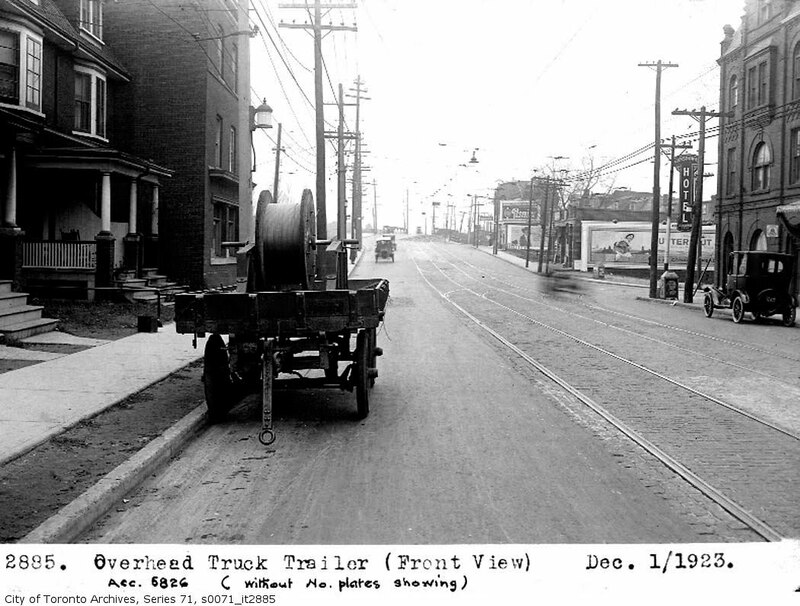 More on this mysterious story here. 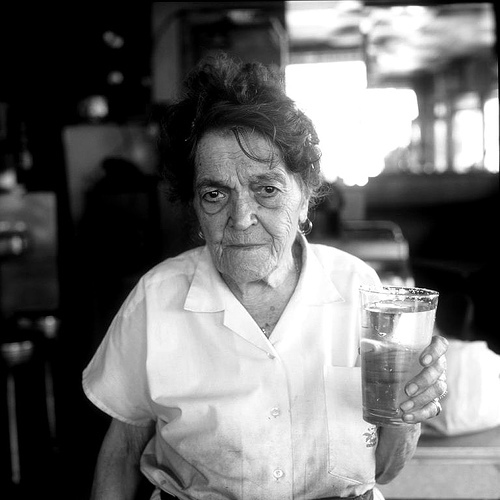 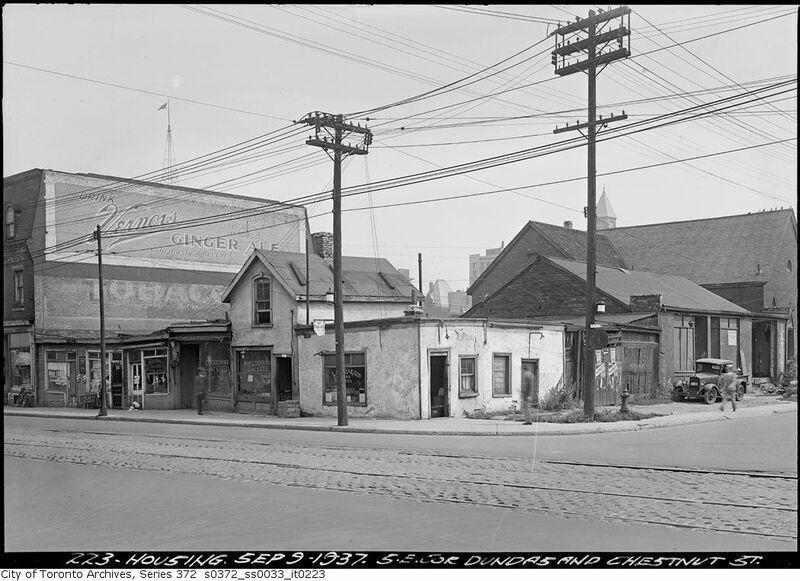 He was known to frequent the bar at the foot of Ossington. 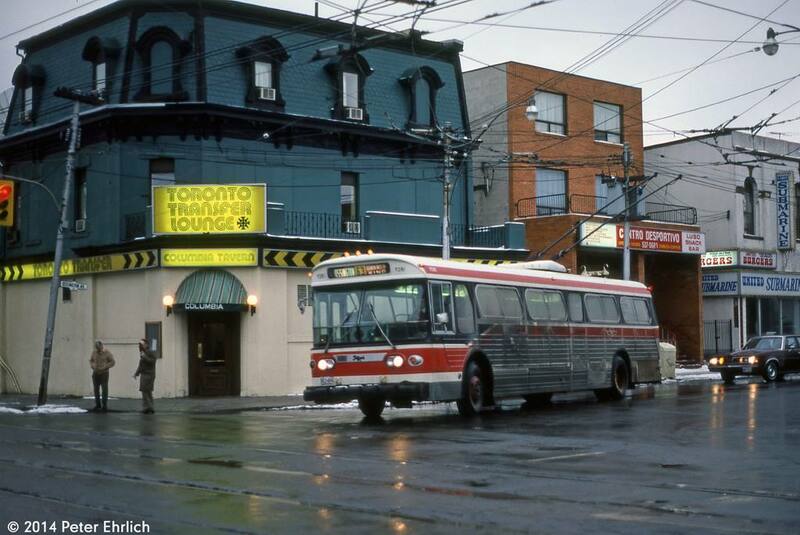 Another shot from the &0’s when the bar was called the Toronto Transfer Lounge. 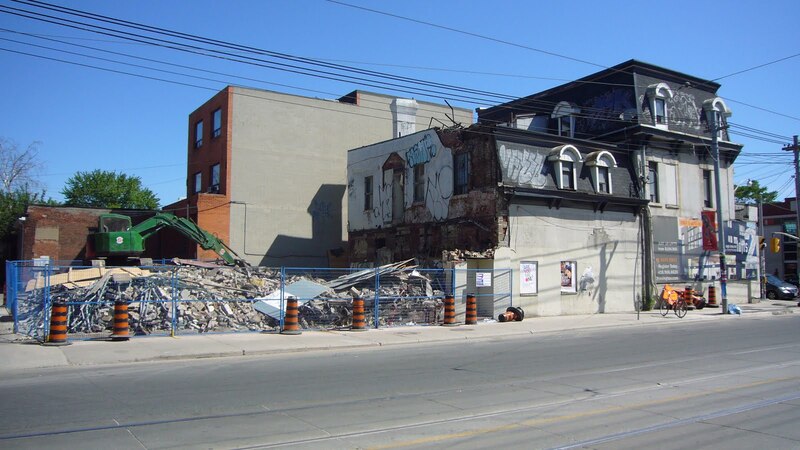 The old Hotel being demolished to make room for….. 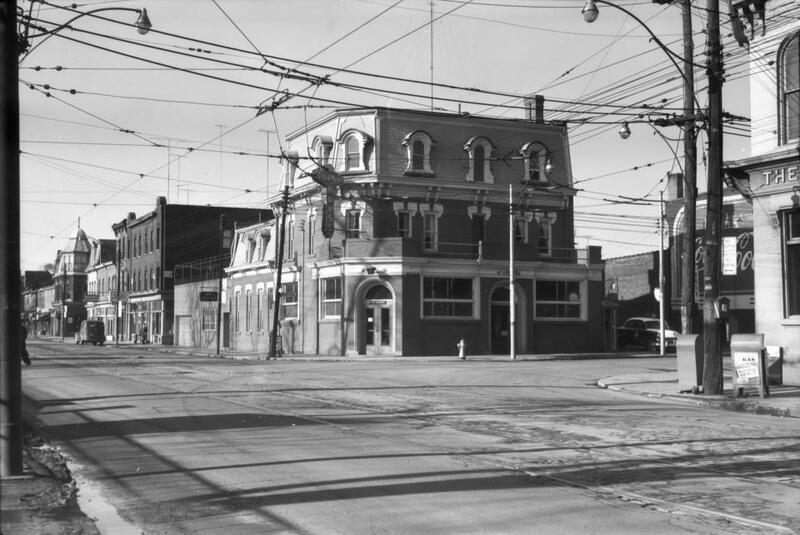 Thank fully the hotel has been demolished and replaced by a Starbucks. 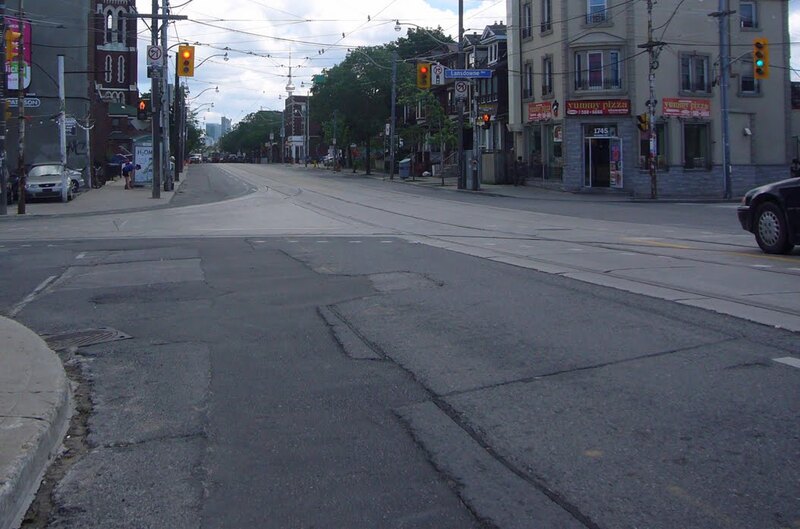 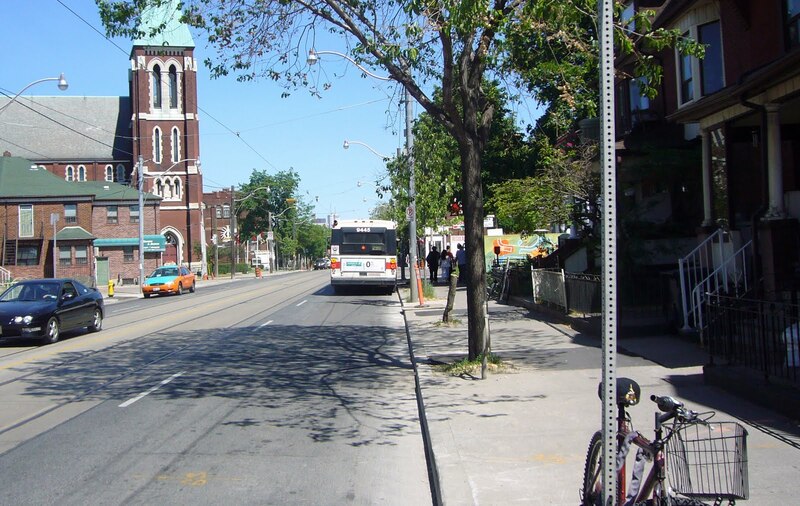 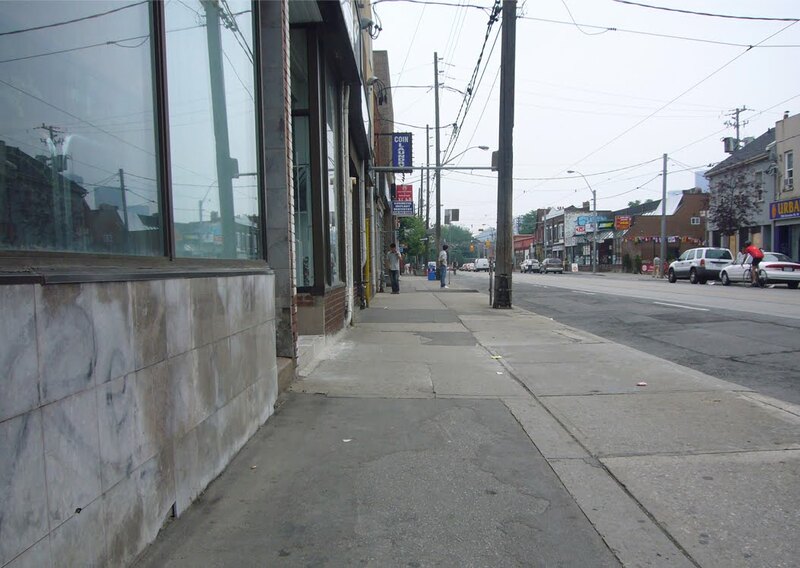 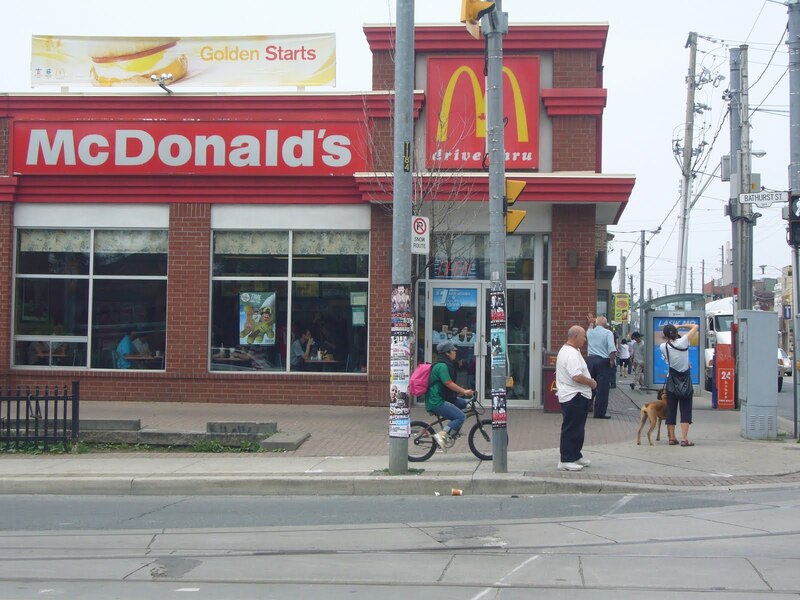 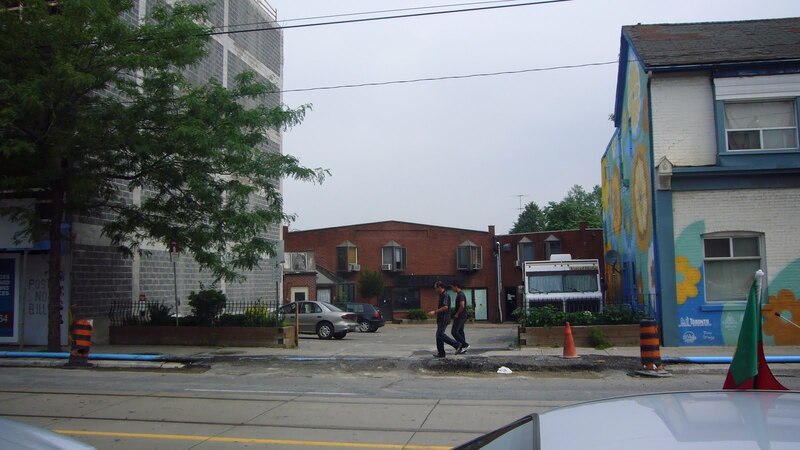 It seems to be difficult for modern Torontonians to go more than a block without a refill. 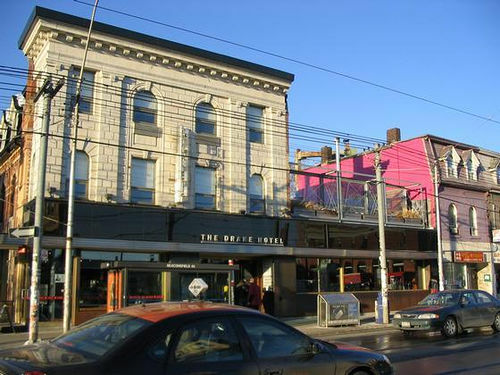 He’s also rumoured to have hung out at the old Drake Hotel further west on Queen. 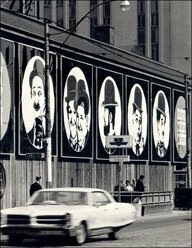 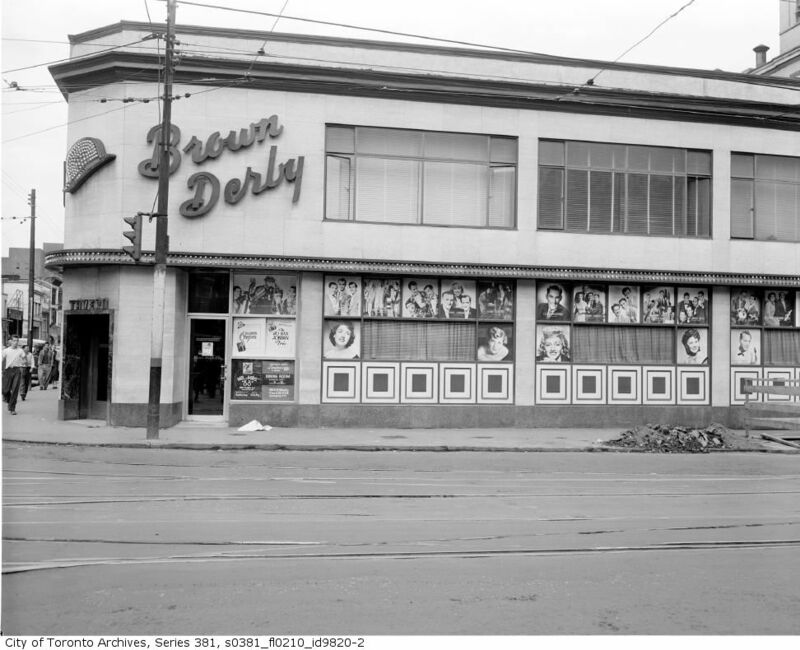 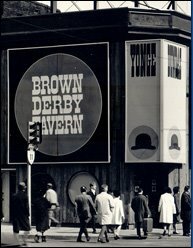 The Brown Derby, located on the N/E corner of Yonge and Dundas was open from 1949 until 1974. 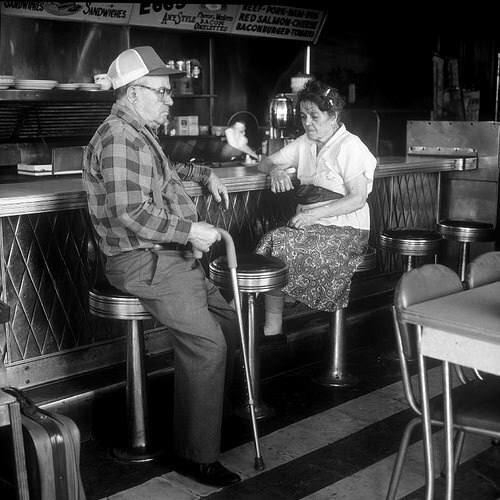 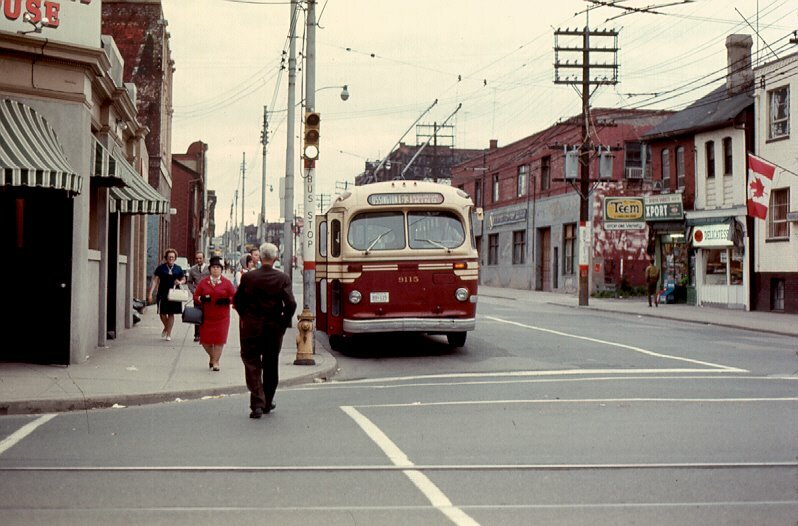 The 1960’s, Photo by R. Hill. 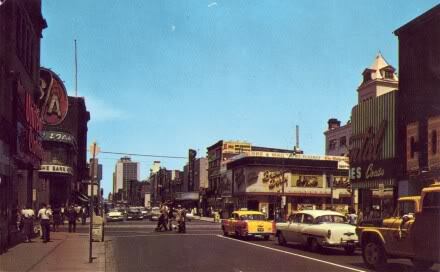 Sometime in the late 1950’s. 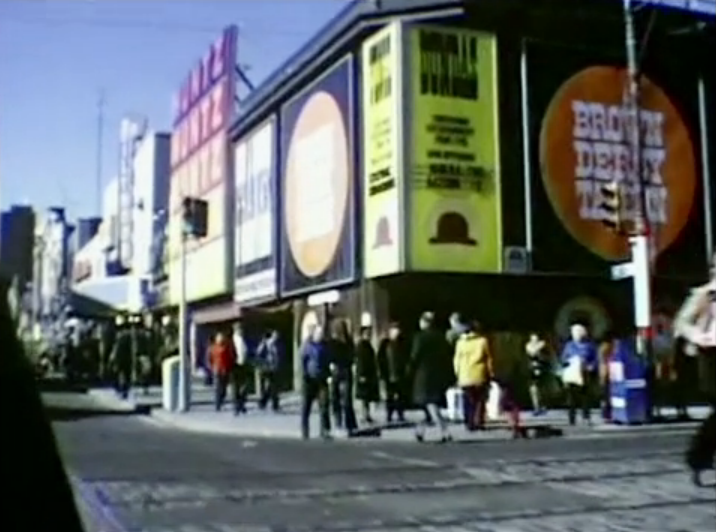 In the 1970’s the exterior had a “mod” face lift. 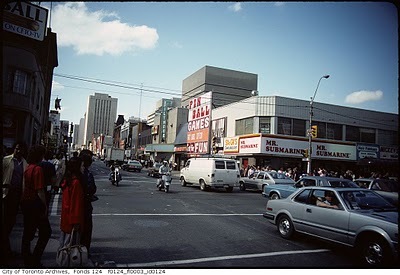 In the 1980’s a Mr. 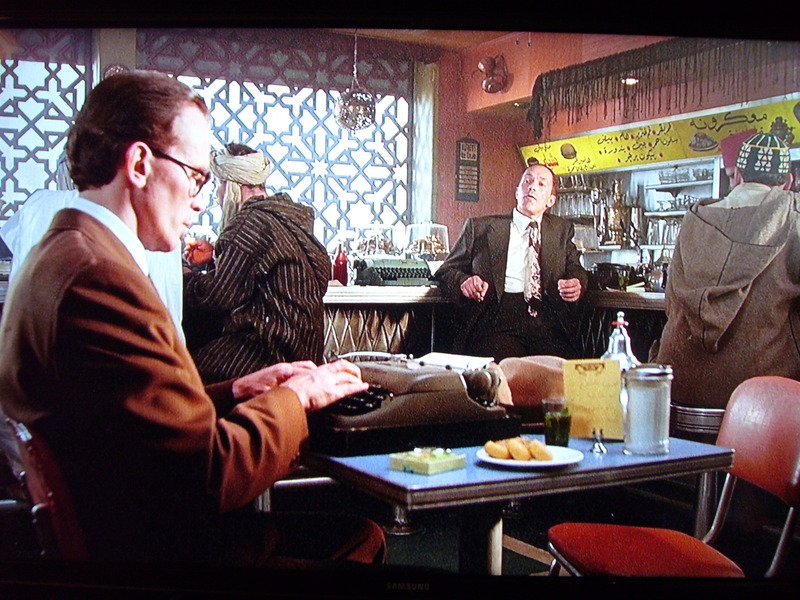 Submarine. 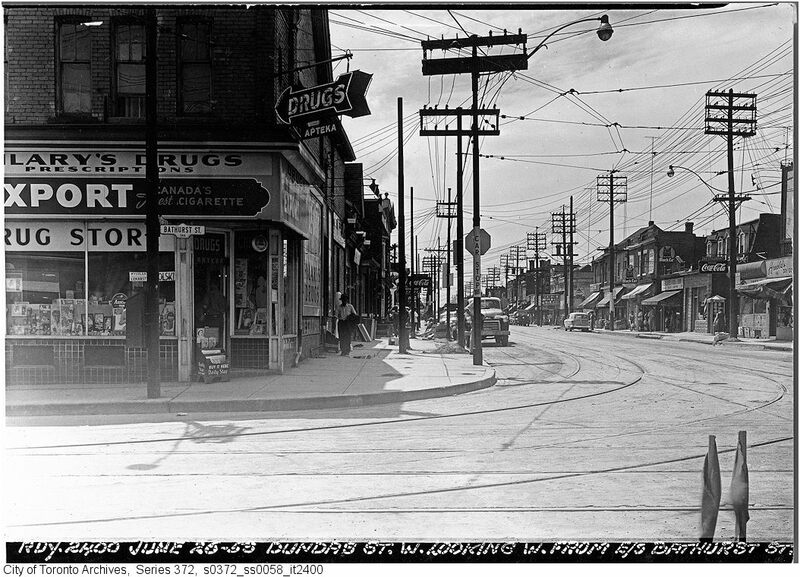 The S/E corner of Dundas W. and Chesnut in 1937 when this was known as the Ward. 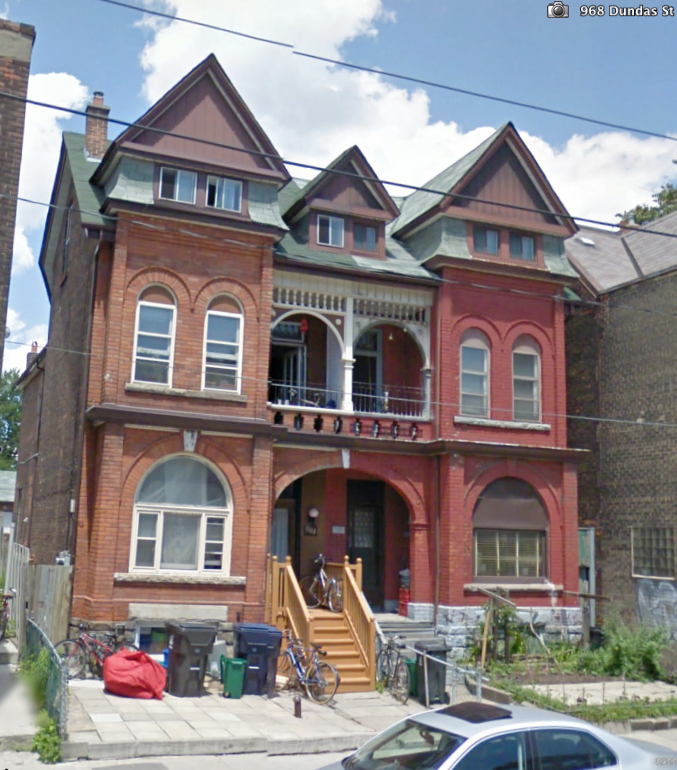 Toronto’s slum district. 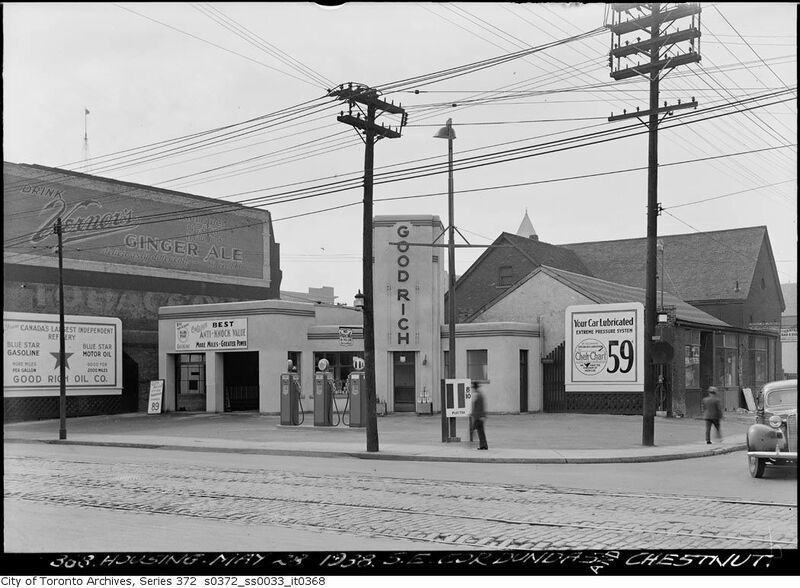 A year later and a very stylish Good Rich gas station has been built on the site. 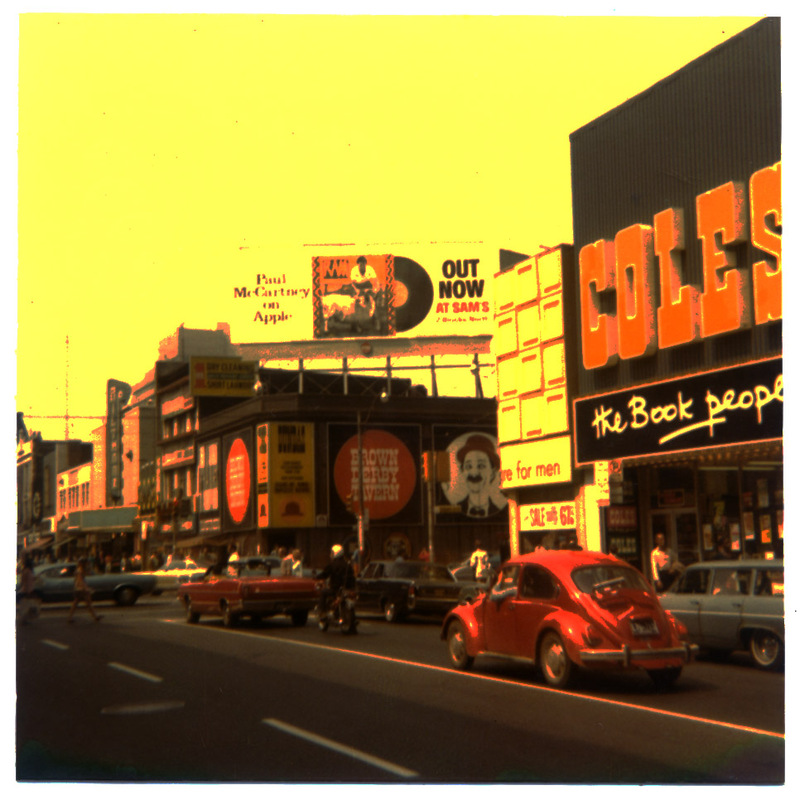 Only 59c to lubricate your car. 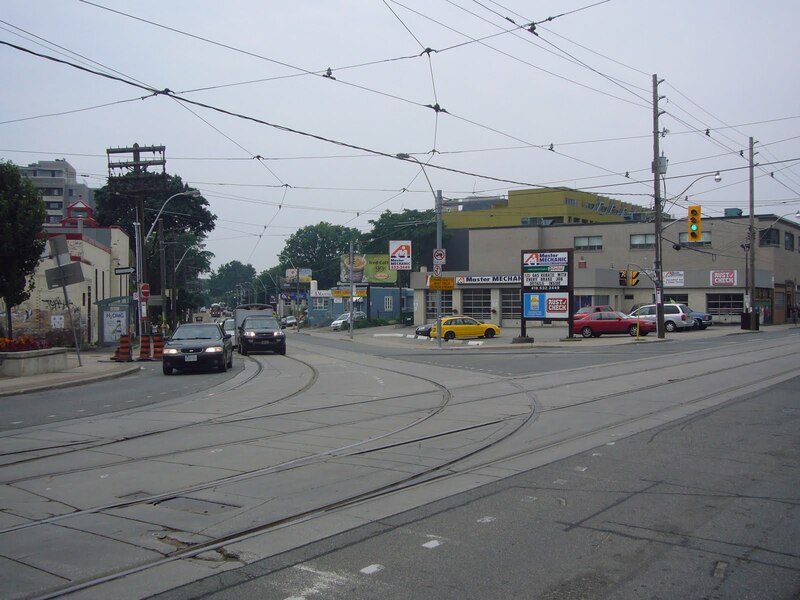 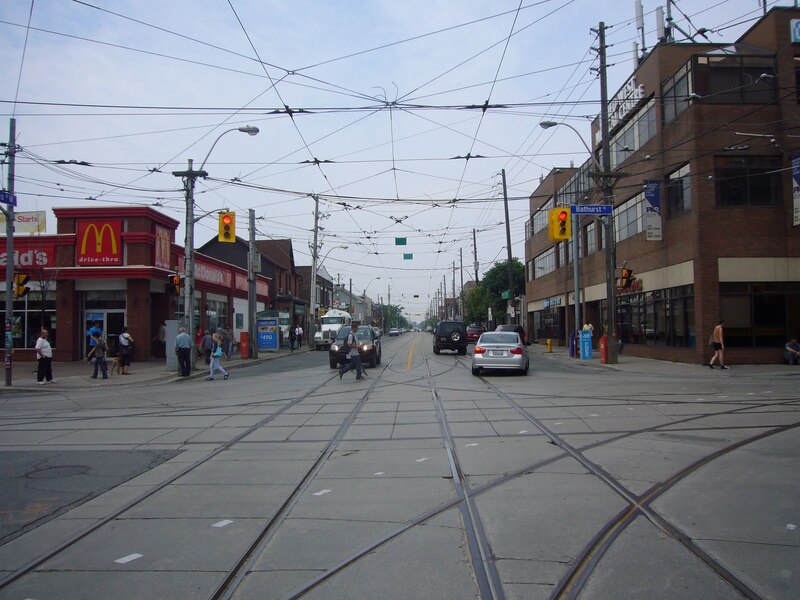 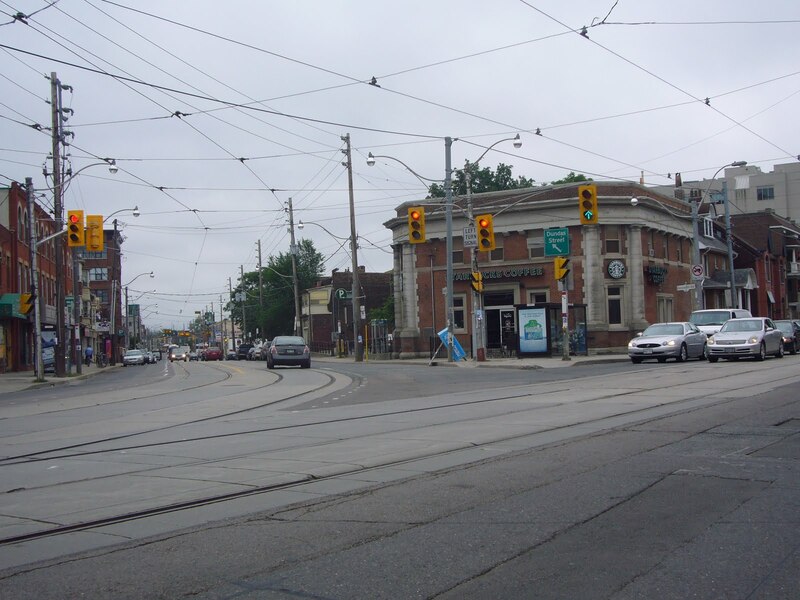 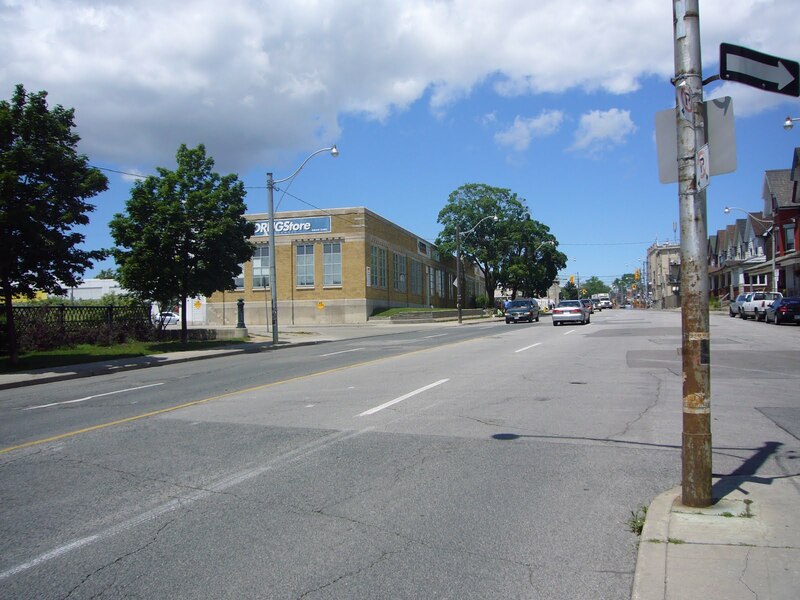 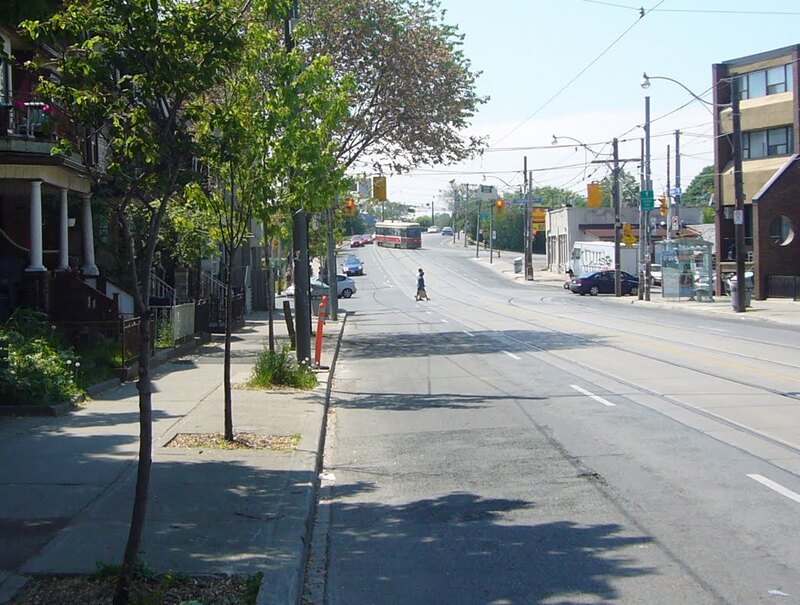 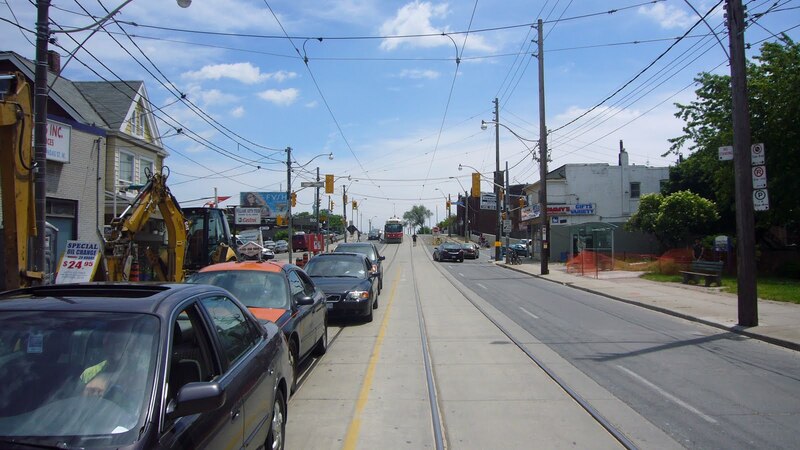 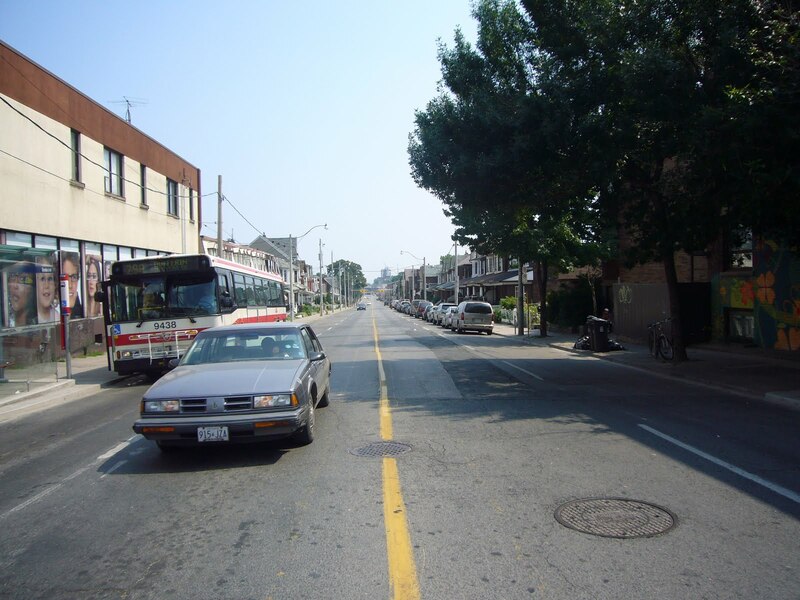 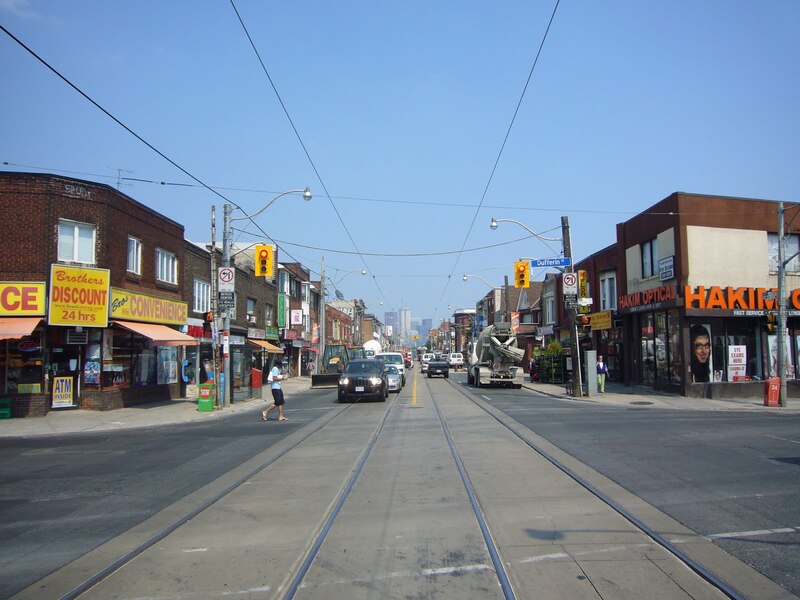 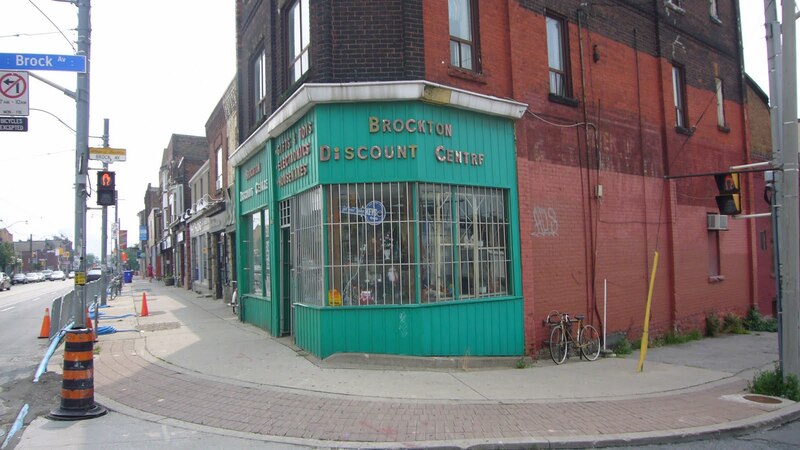 Like Parkdale, Brockton (Brock and Dundas) was a separate town until it was annexed by the city of Toronto in 1884. 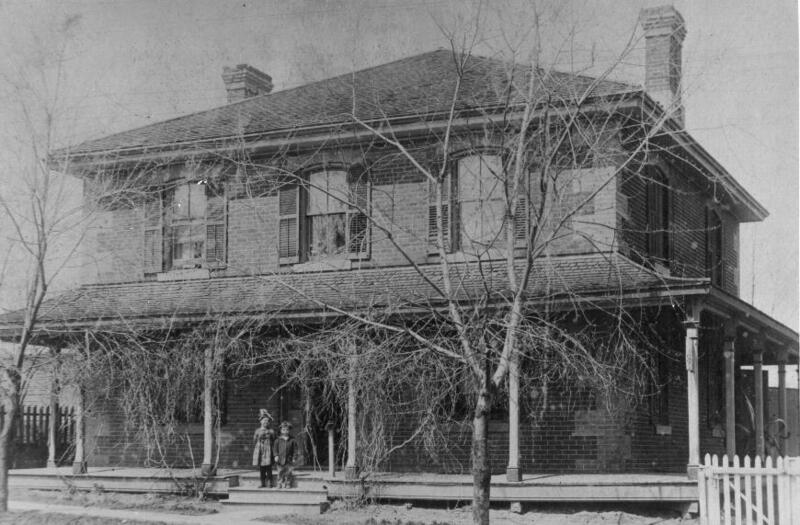 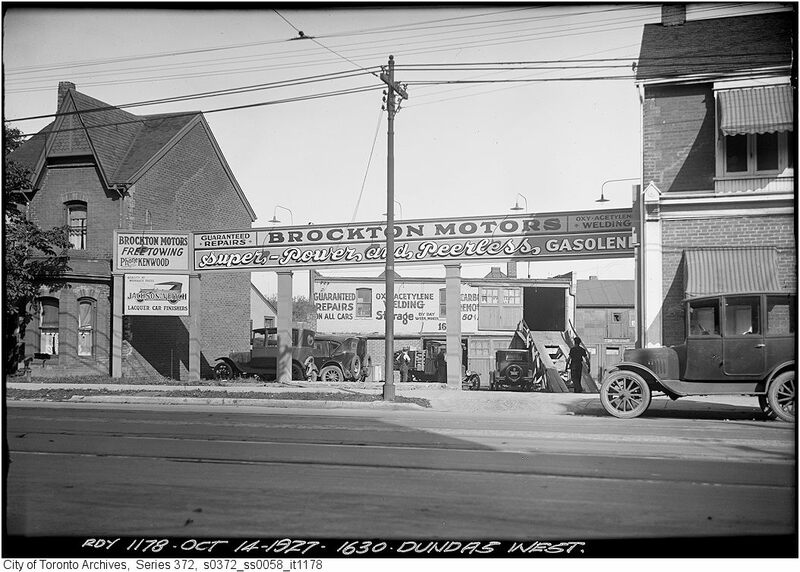 The north side of Dundas just west of Brock Ave. in 1927. 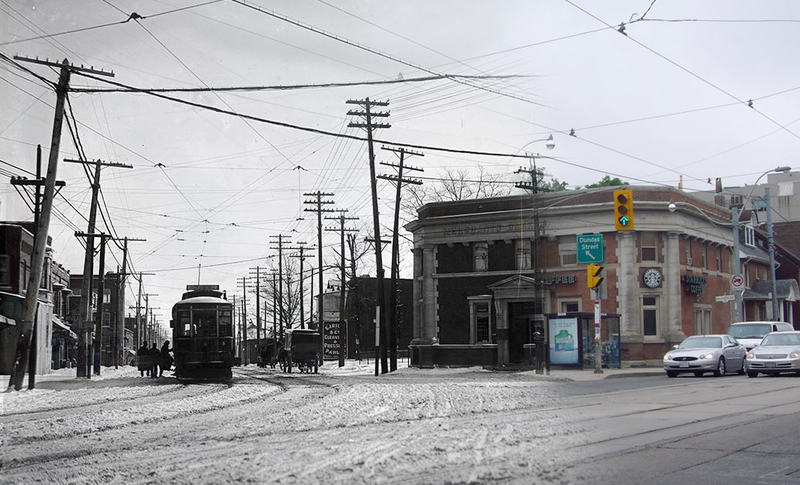 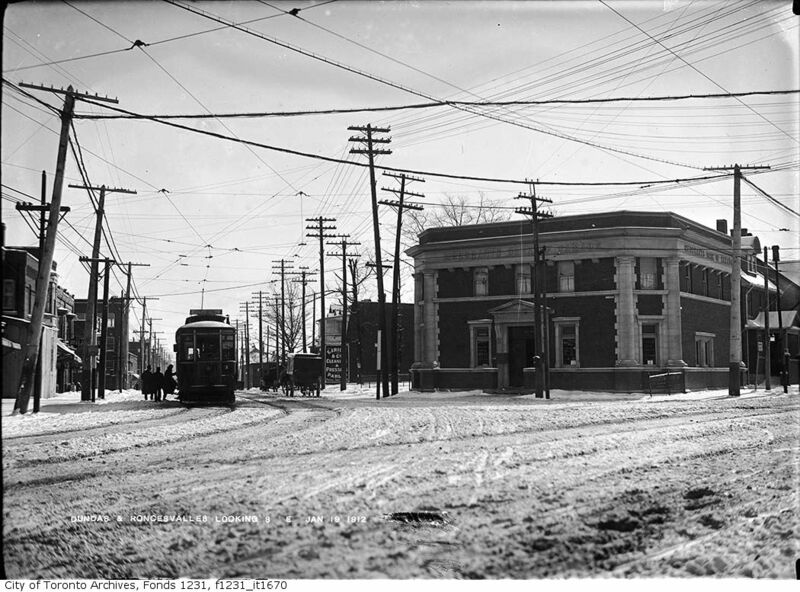 The intersection of Dundas and Roncesvalles in 1912. 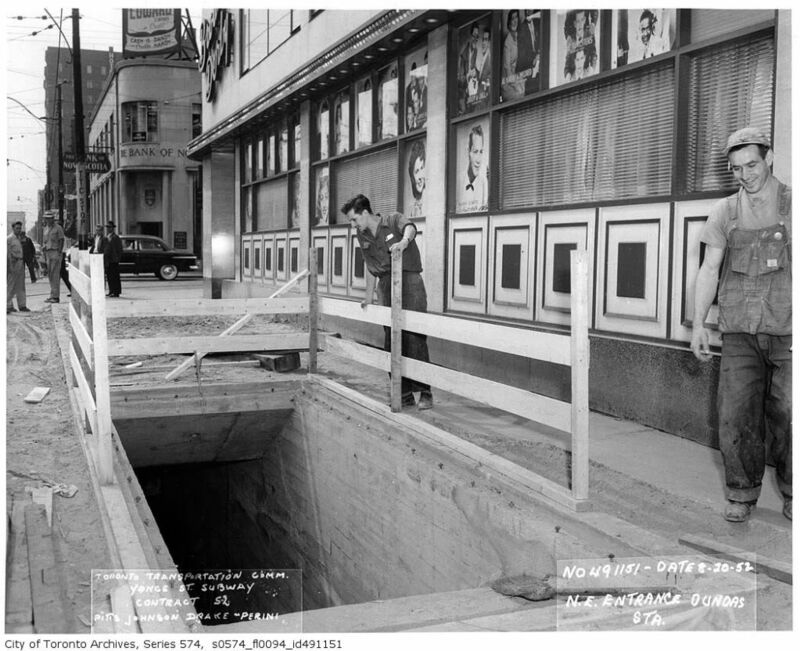 Toronto’s infamous Boyd Gang started their crime spree by robbing this branch of the Bank of Montreal in November of 1951. 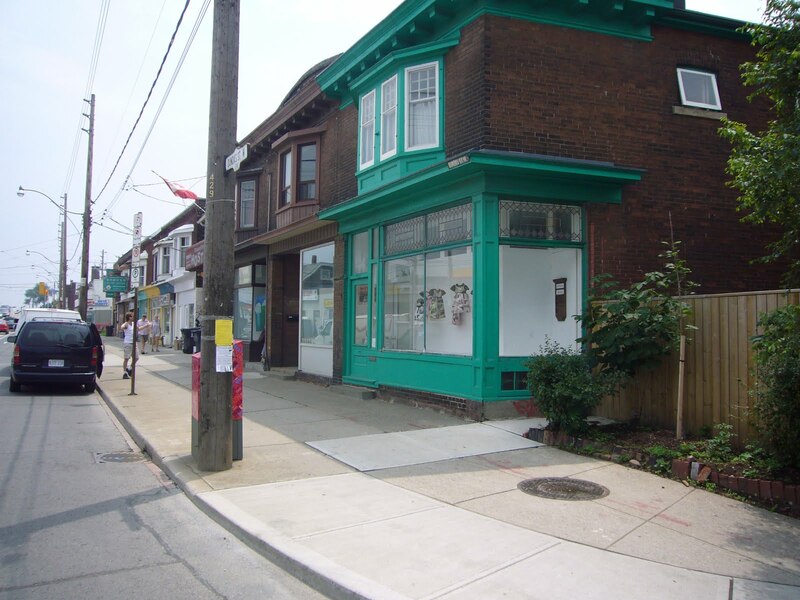 2010 and the bank is now a Starbucks…. 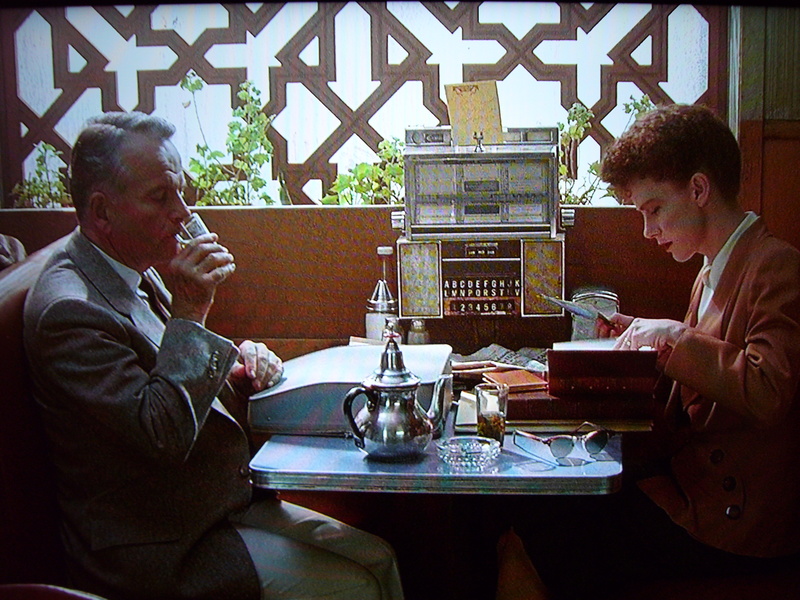 how can people drink this much overpriced coffee? 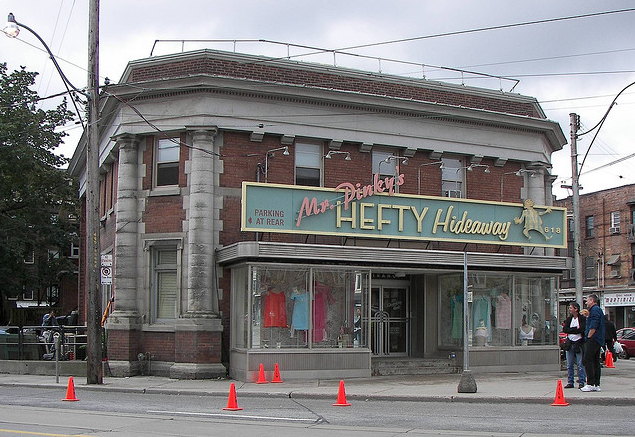 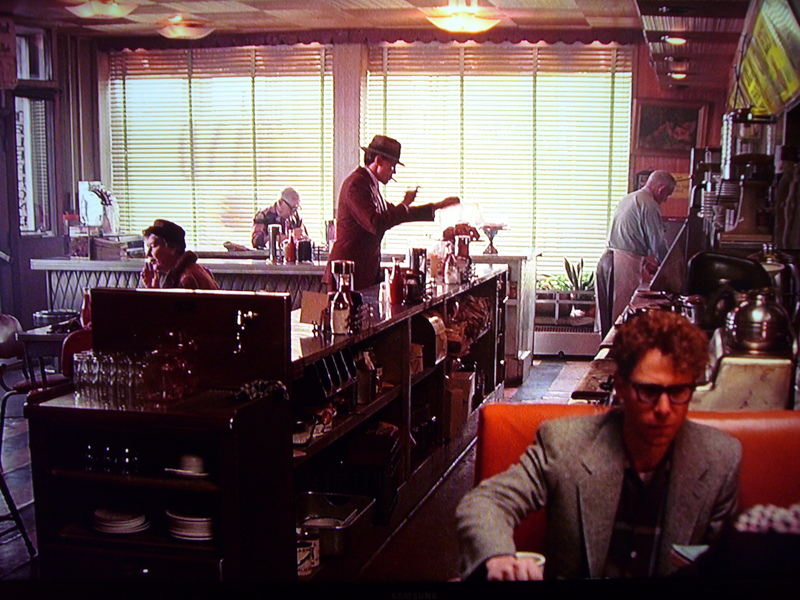 The bank also served as the location for Mr. Pinky’s Hefty Hideaway for the film Hairspray. 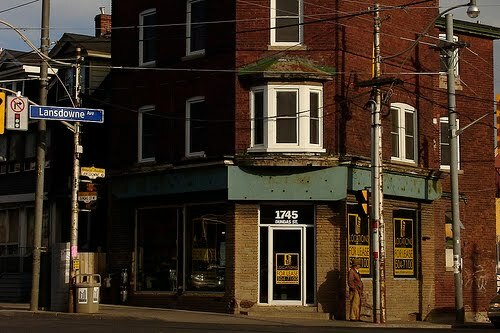 Photo courtesy of Bill Platten. 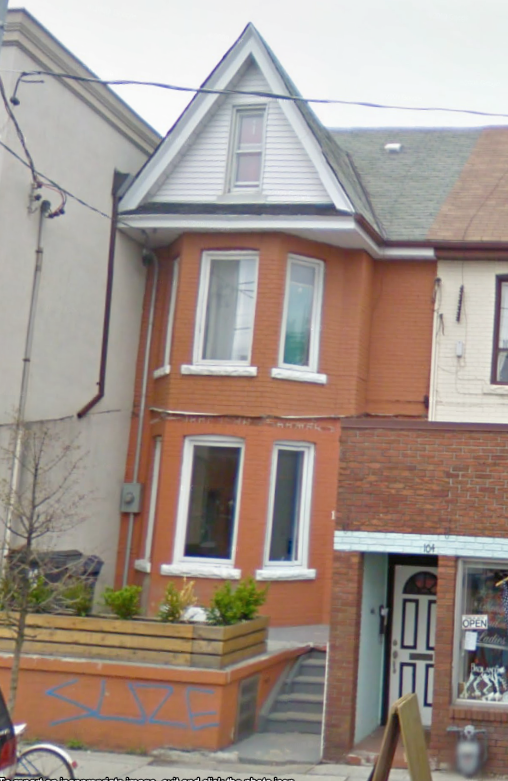 This old house on Dundas near Burnhamthorpe has managed to survive. 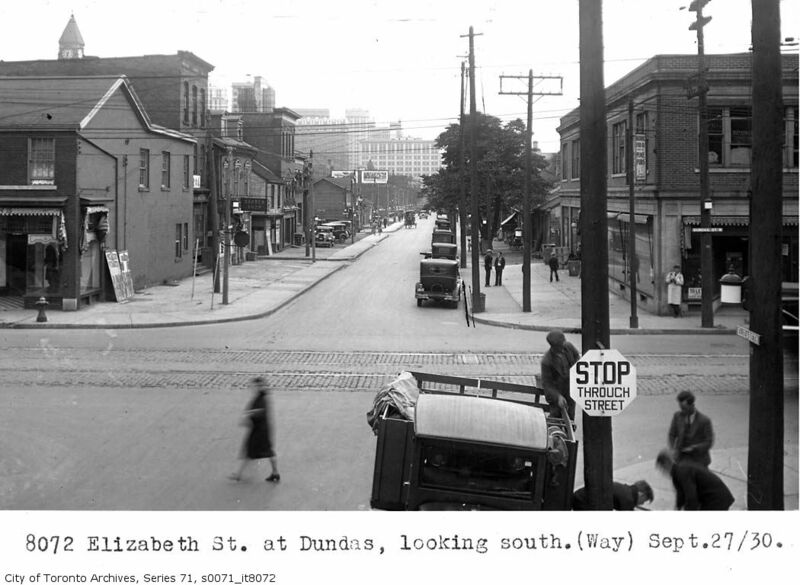 Dundas Street West looking south down Elizabeth in 1930. 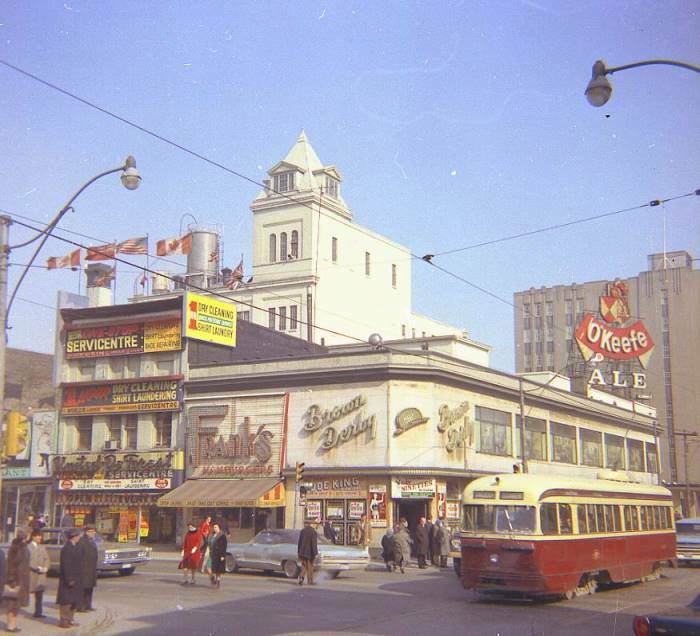 A similar view in 2010 , That’s new City Hall (1966) in the background. 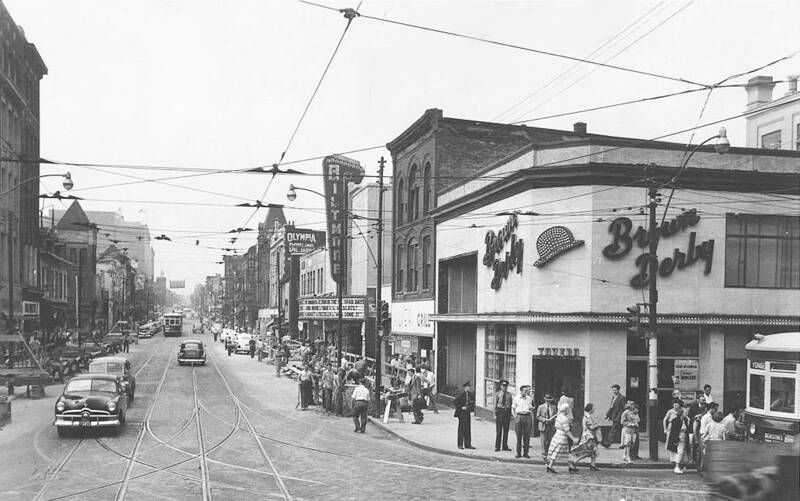 the 1930’s. 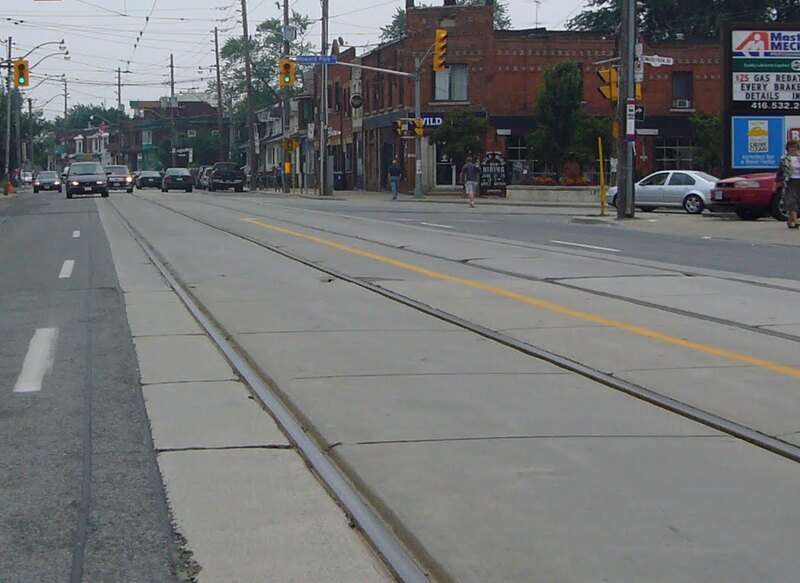 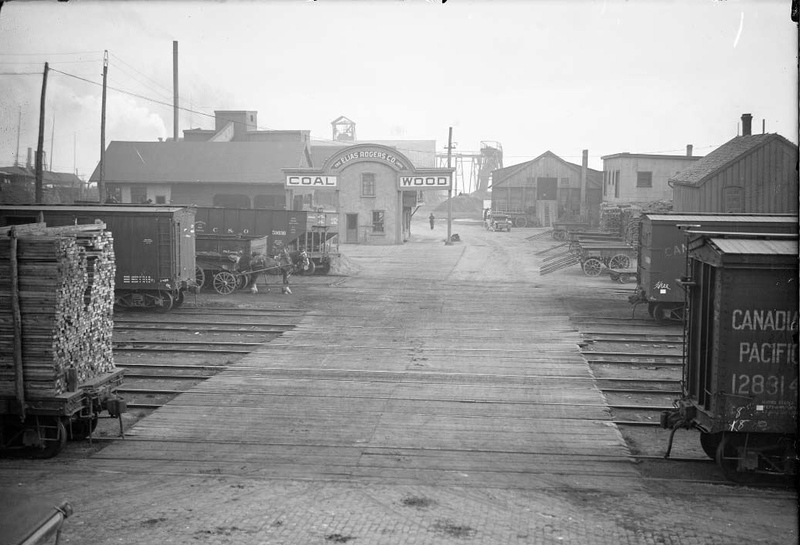 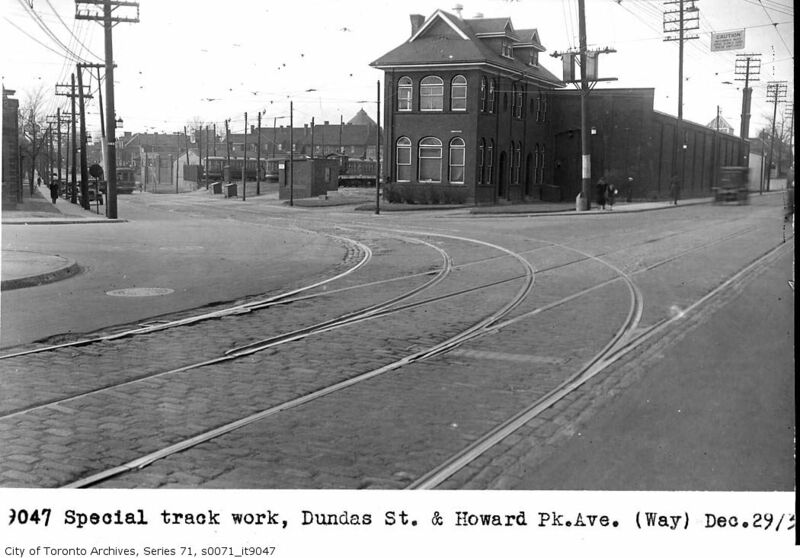 At this time the streetcar tracks had a dedicated side of the bridge as seen on the left hand side of the photo. 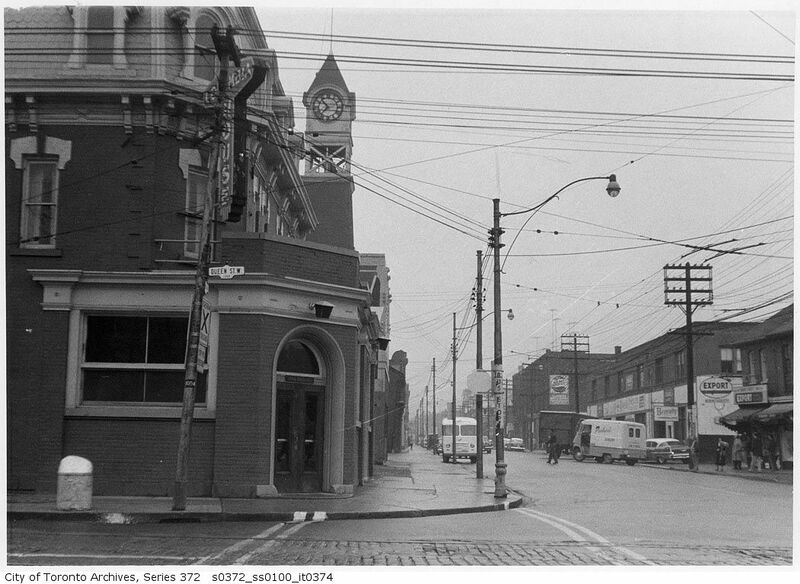 A similar view in 1969. 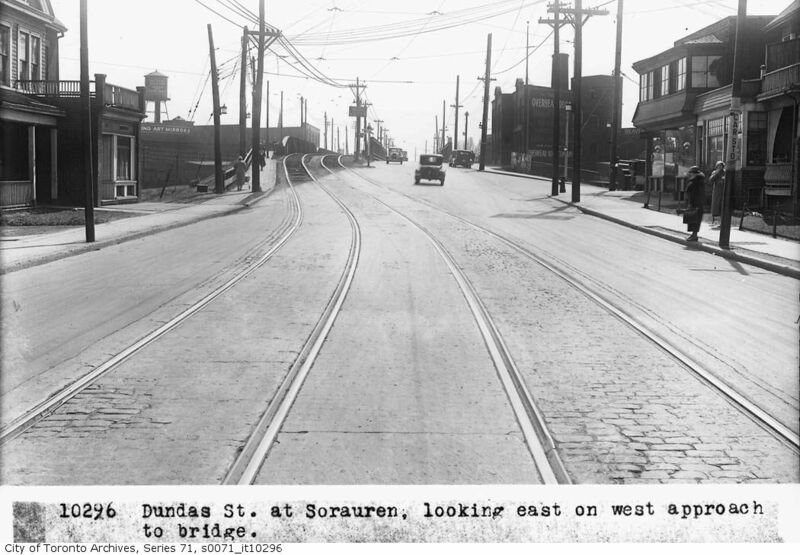 From the foot of the Dundas bridge looking west across the top of Sorauren in 1936. 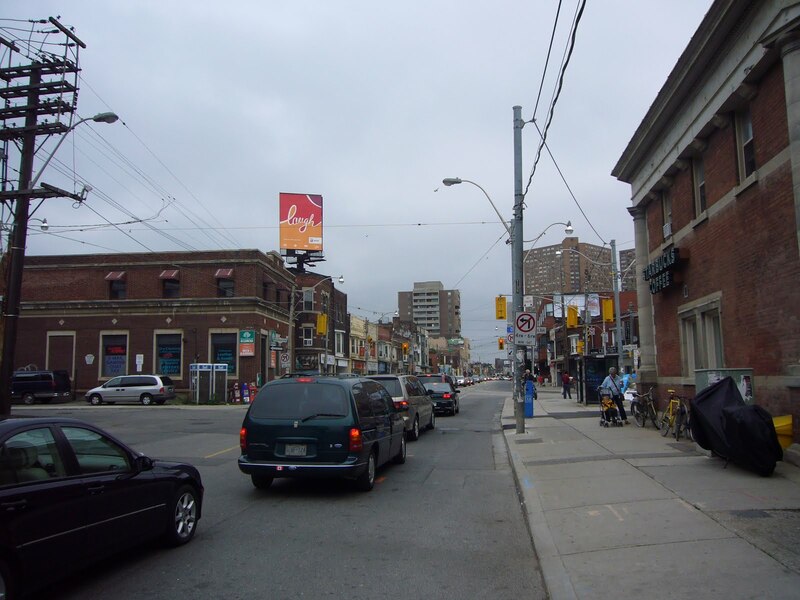 A similar vantage point in 2010. 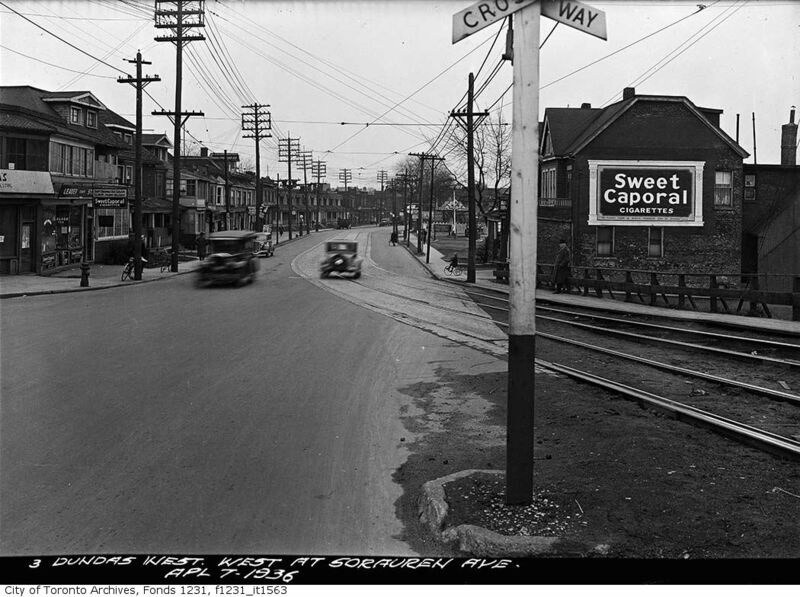 Have you noticed how many ads there are for Sweet Caporal Tobacco? 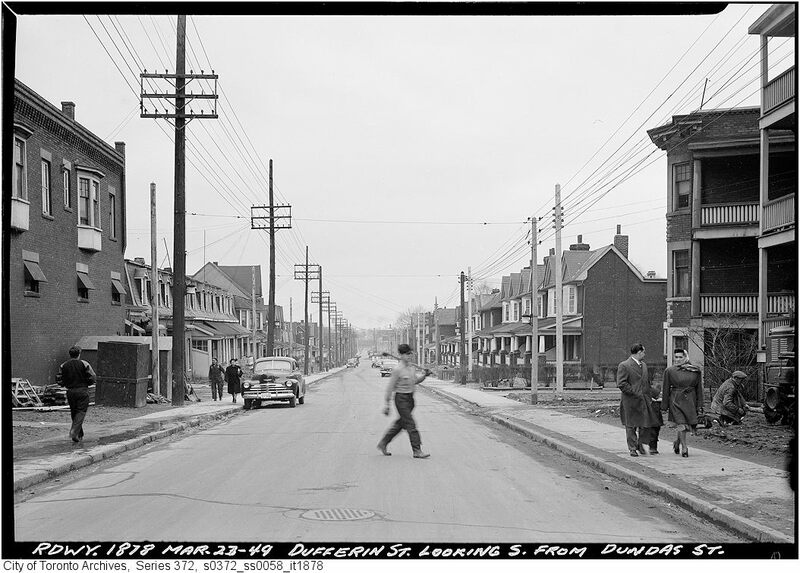 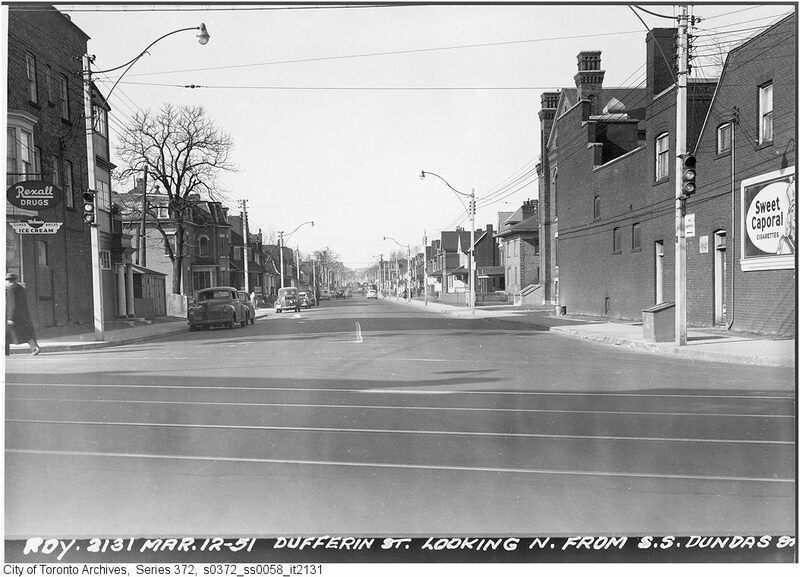 Looking east along the south side of Dundas from Parkway Avenue in 1935. 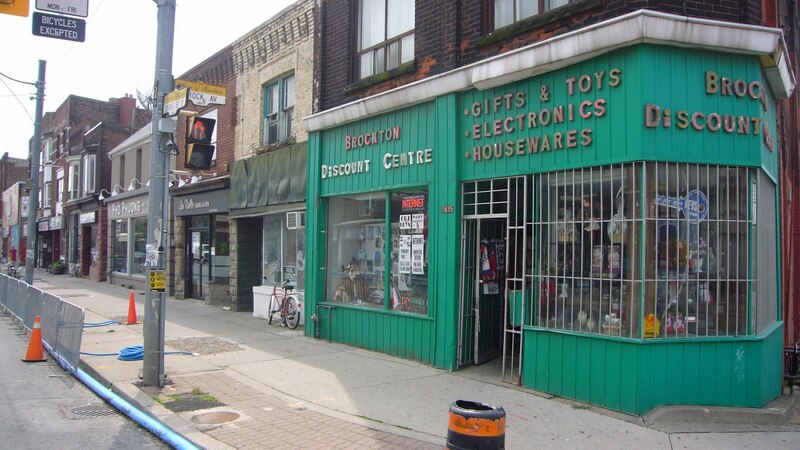 An electric radio is $8.00! 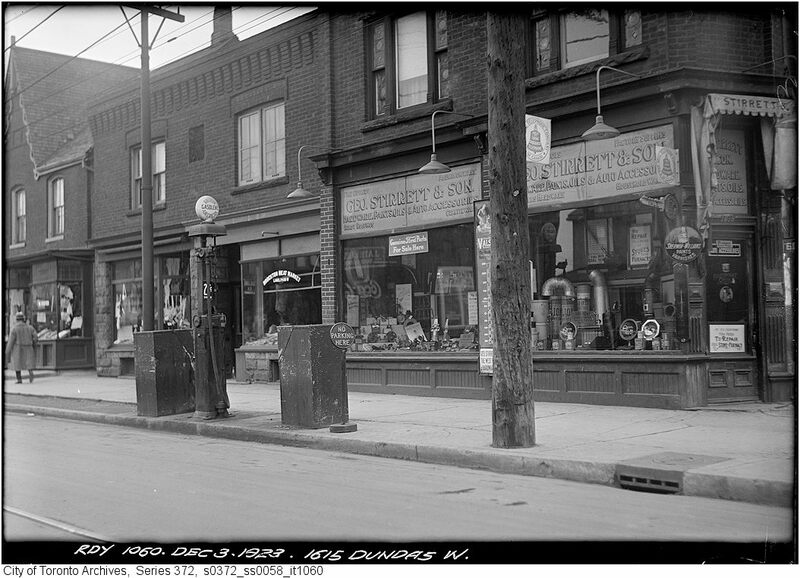 A different angle of George Stirrett and Sons Hardware 1930. 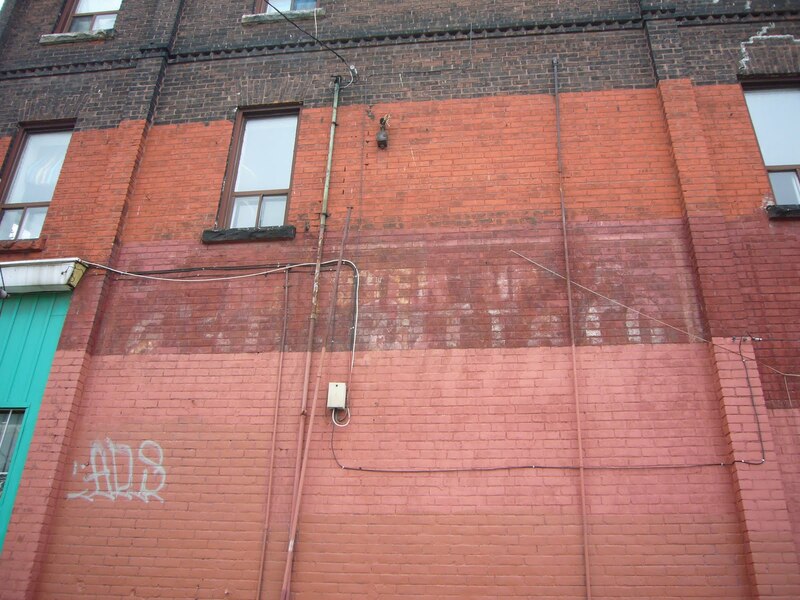 A ghosted sign is still visible on the side of the building. 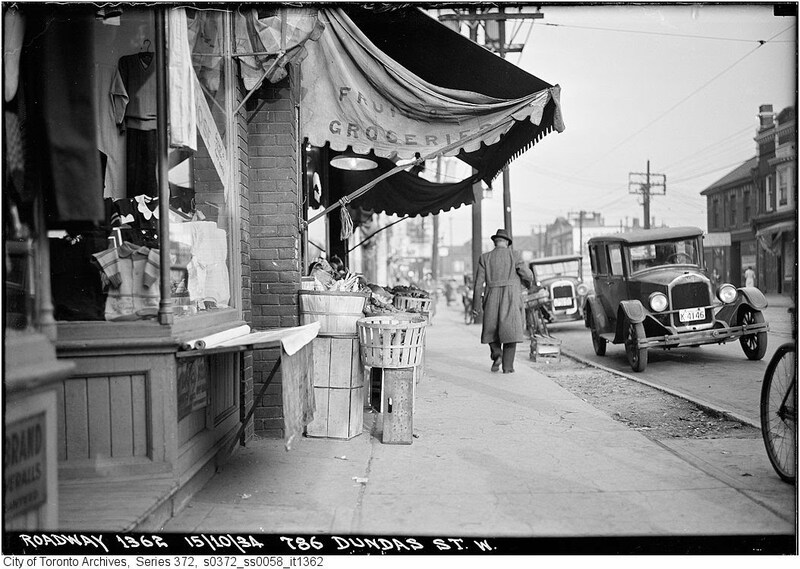 The S/E corner of Dundas and Brock in 1927. 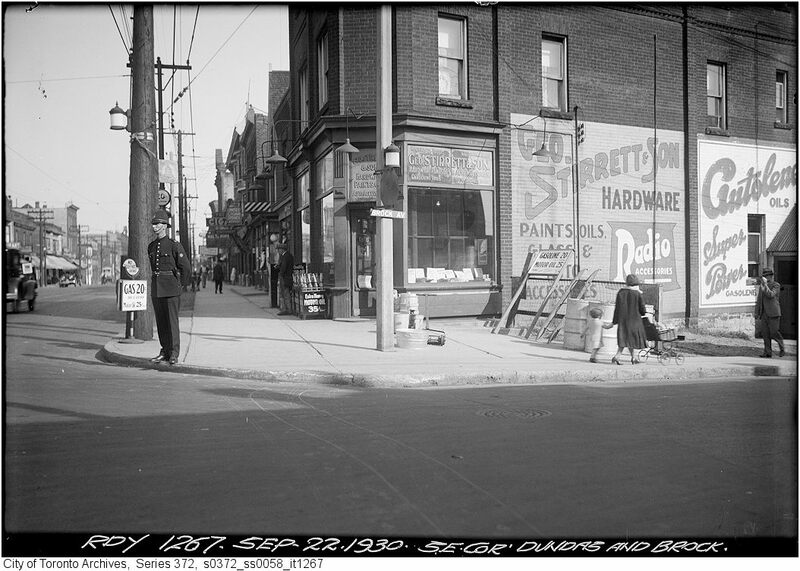 George Stirrett and Son Hardware store, sellers of hardware, paint, oils and auto accessories. 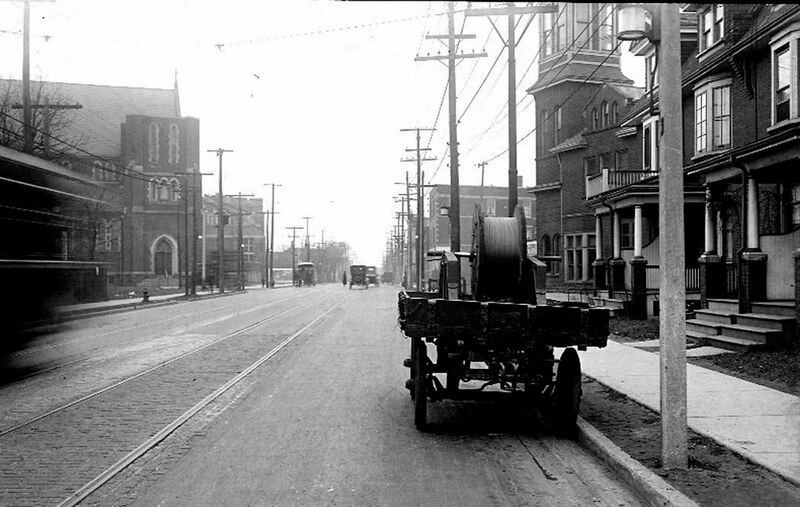 Note the single gas pump by the curb to the left hand side of the photo. 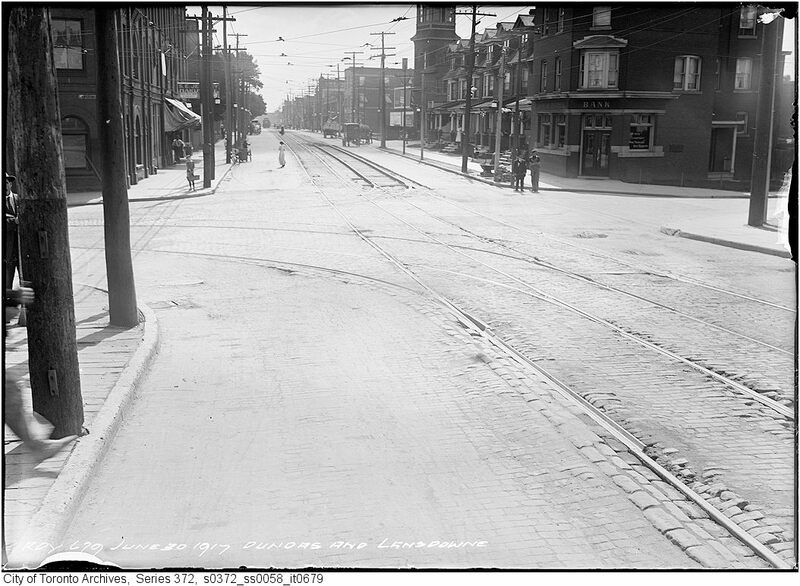 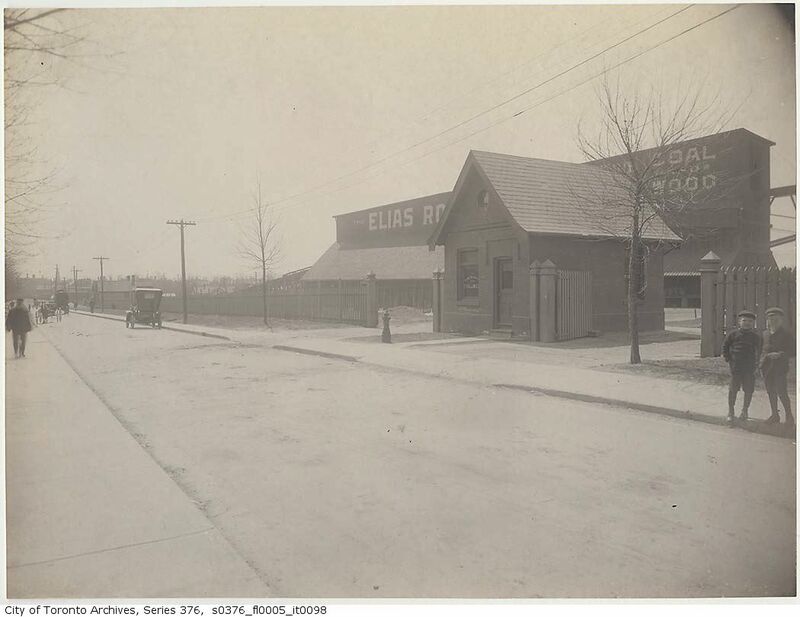 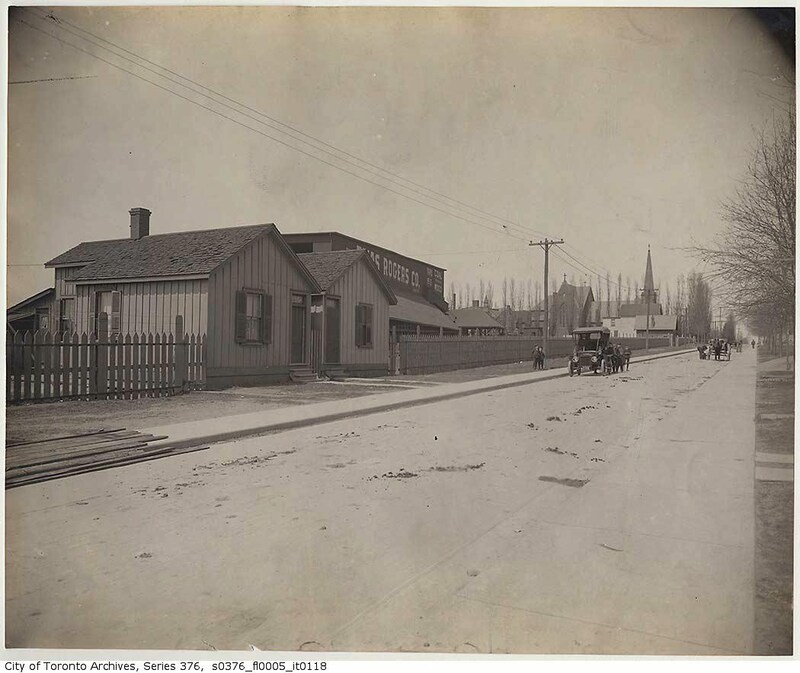 An early shot of Lansdowne looking north towards Dundas West circa 1912. 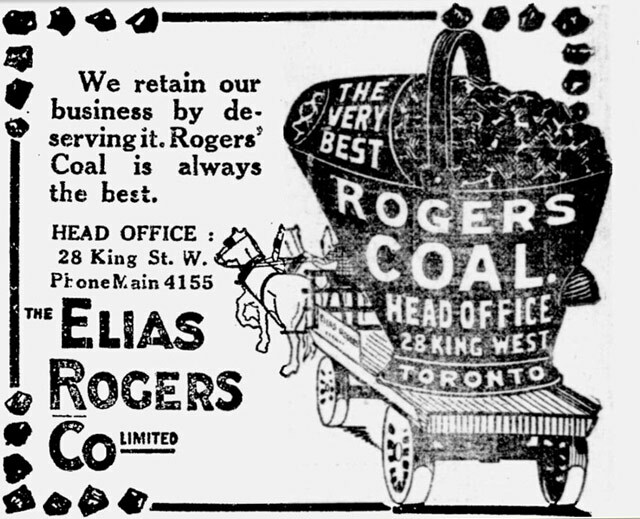 The Elias Rogers Company, suppliers of wood and coal. 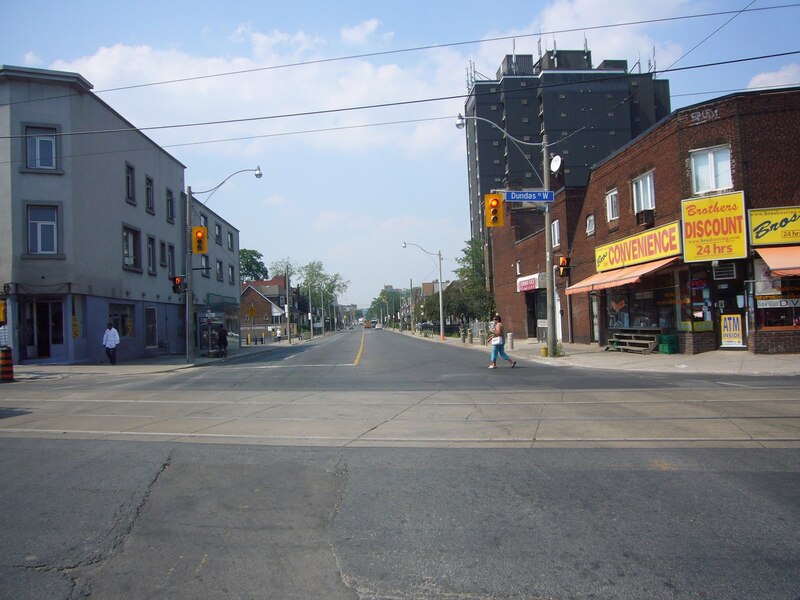 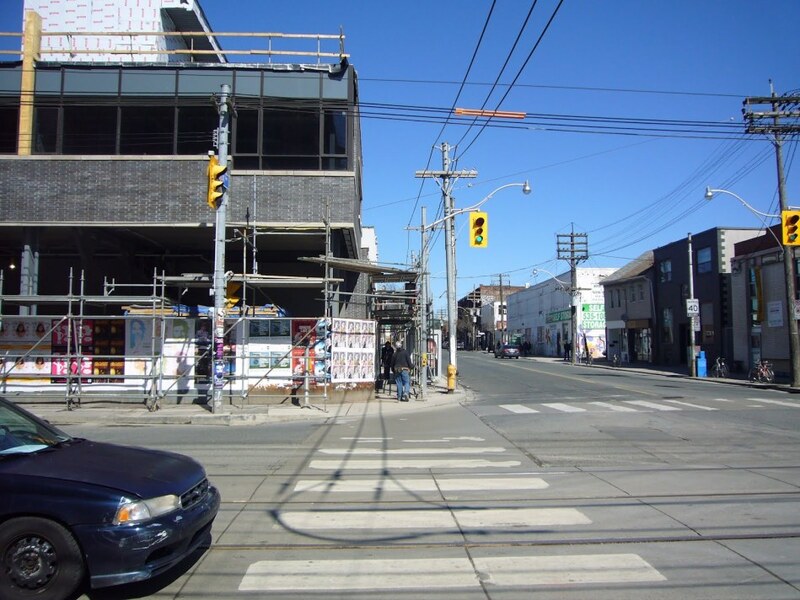 Looking south down Lansdowne from Dundas. 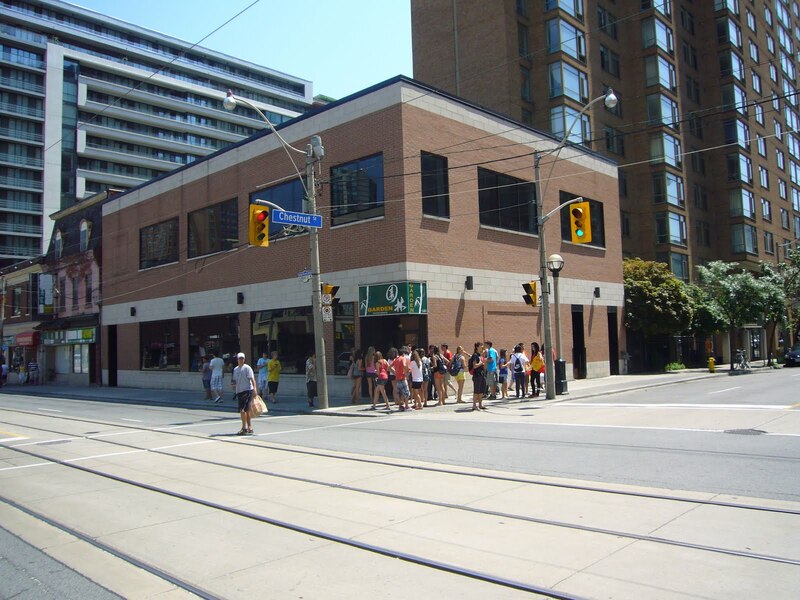 Rogers had another location downtown at The Esplanade and Berkeley. 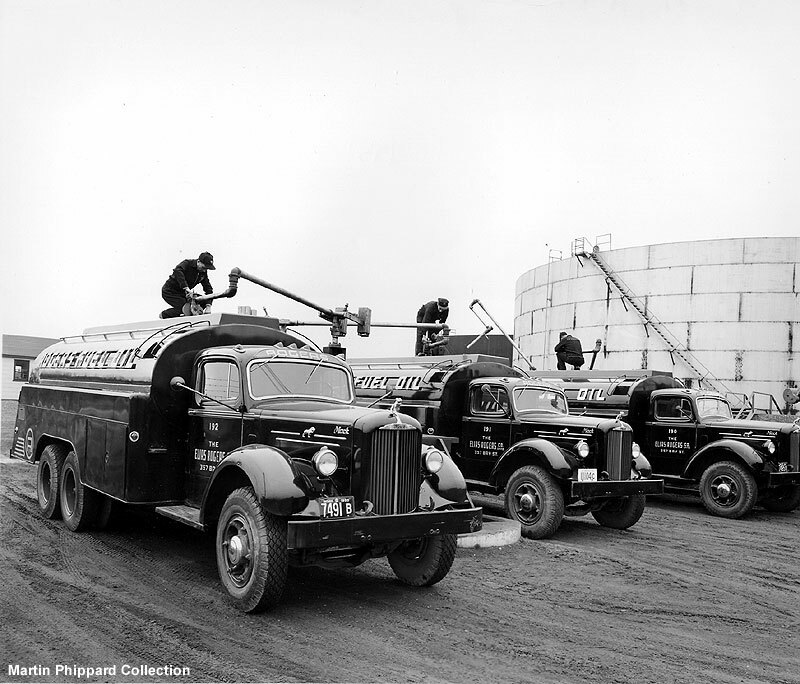 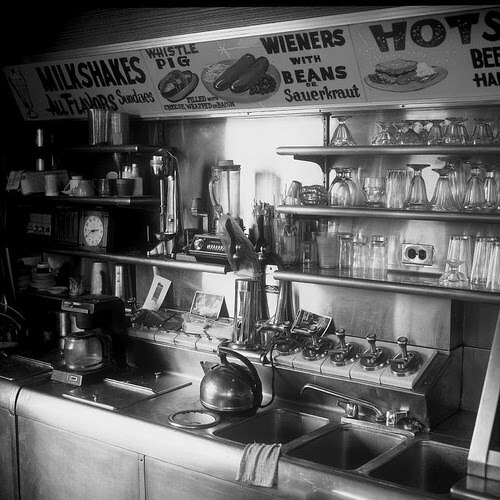 Rogers’ trucks fill up with heating fuel circa 1950. 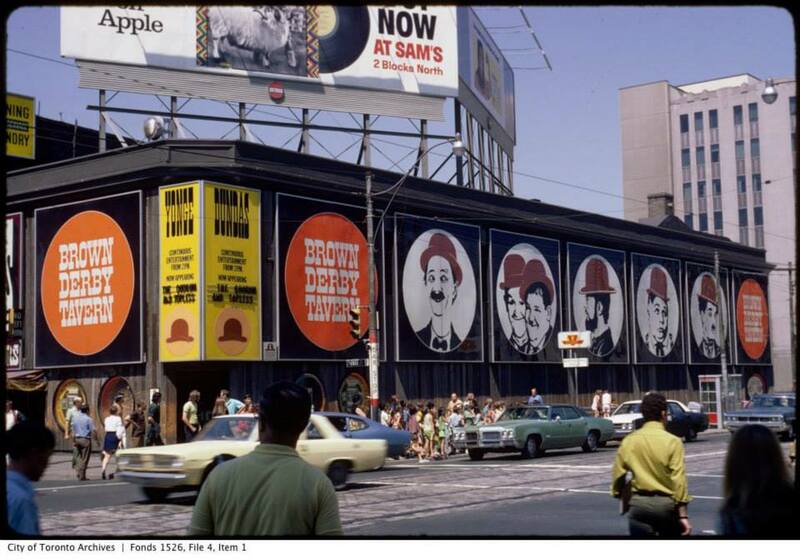 Photo courtesy of the Martin Phippard Collection. 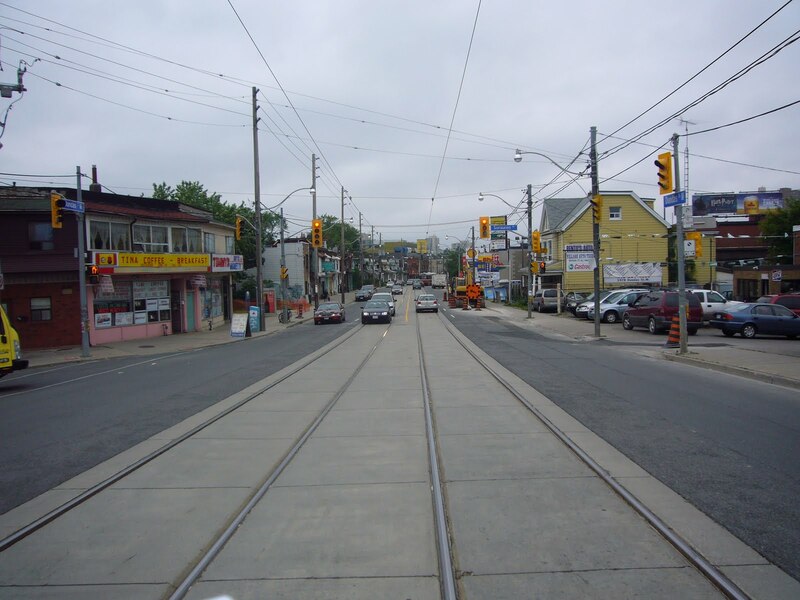 The TTC has been very good at documenting their work over the years. 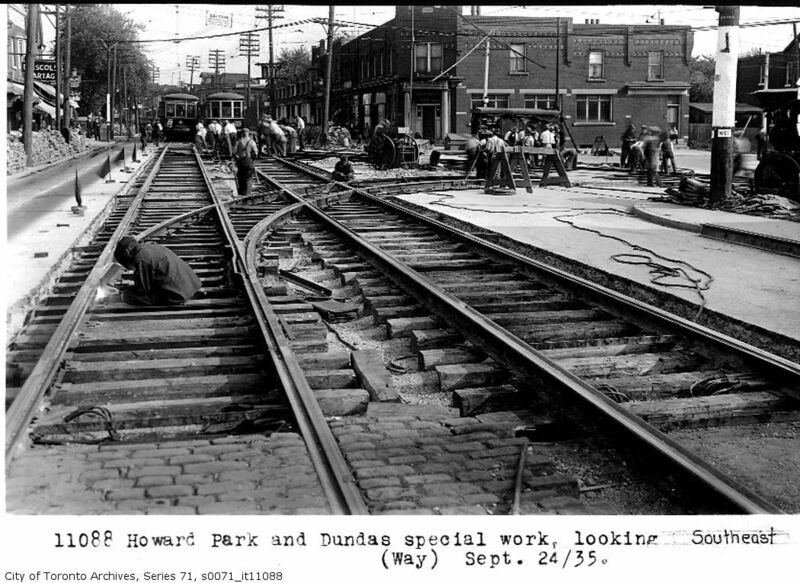 The photos tend to concentrate on the track details but there’s usually enough information in the background to make them interesting. 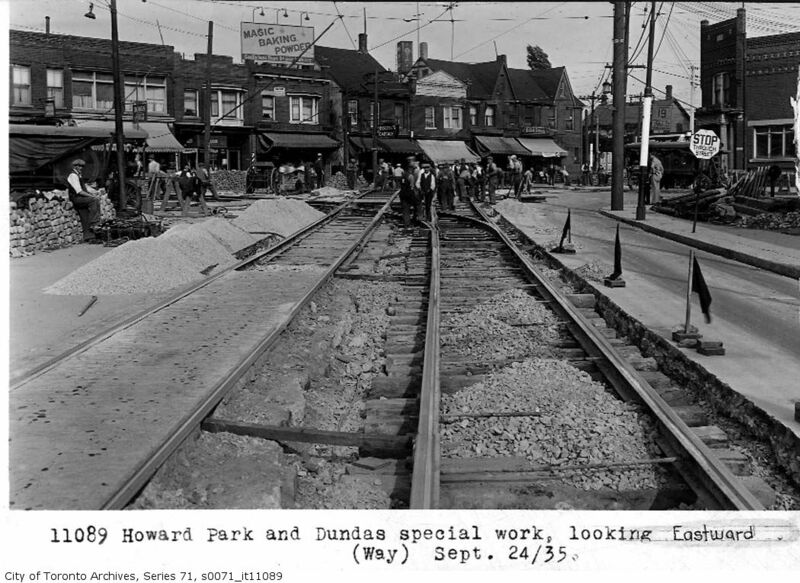 Here’s a series of photos of the track replacement at the intersection of Dundas and Howard Park taken in the fall of 1935. 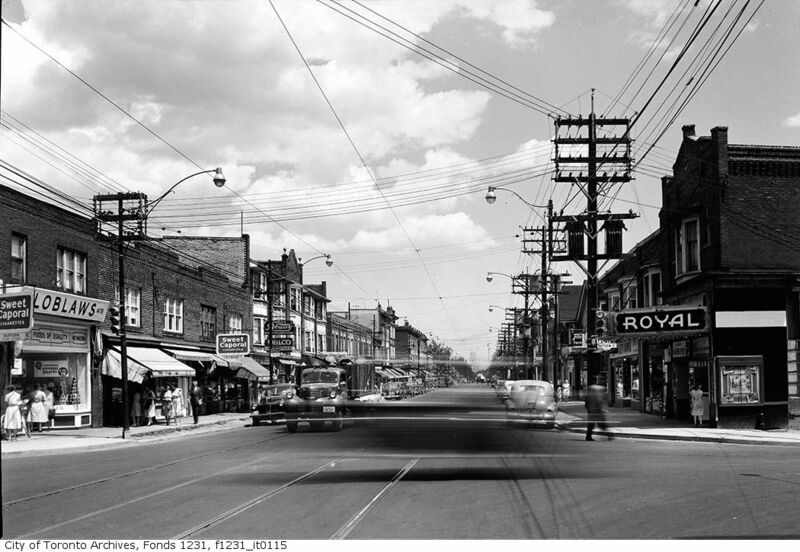 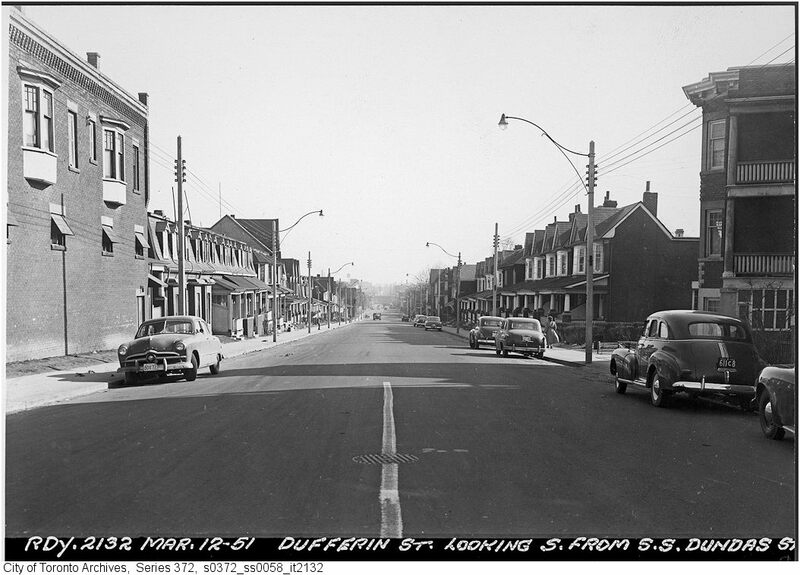 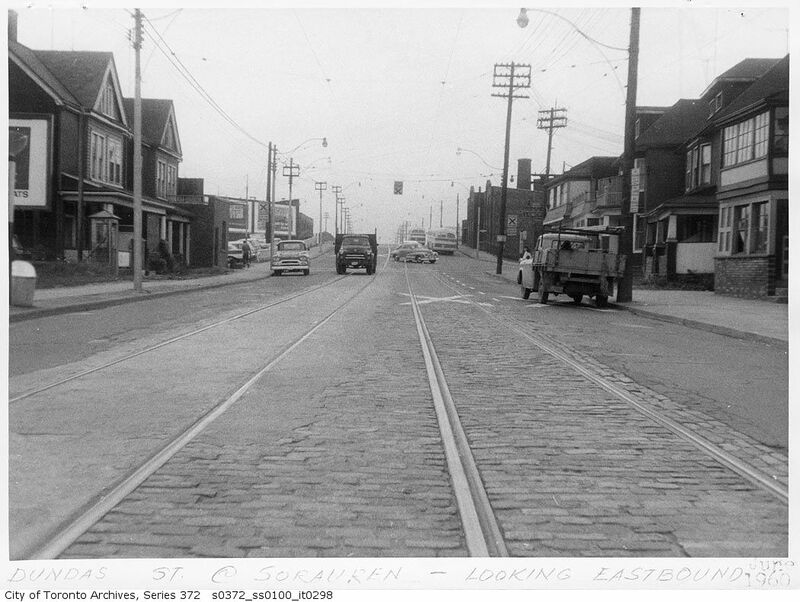 Looking west along Dundas at Bathurst, June 1950. 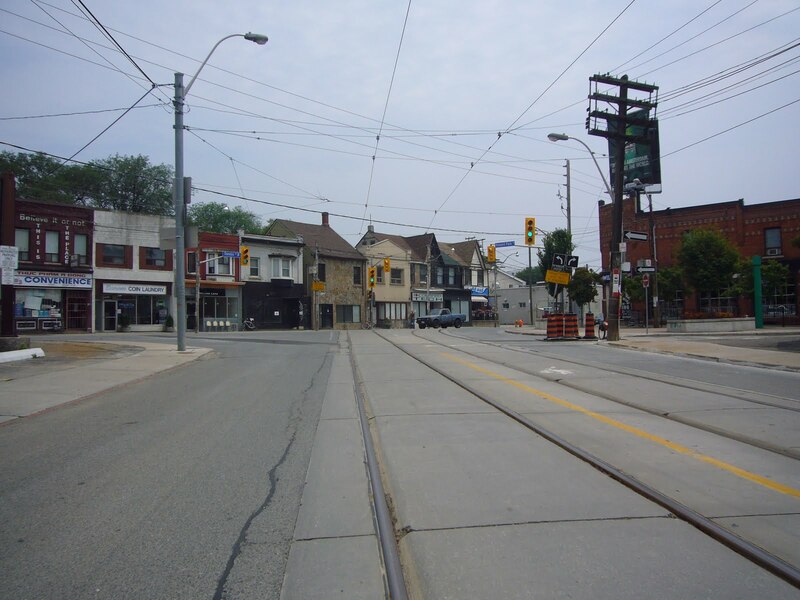 The S/W corner looking west. 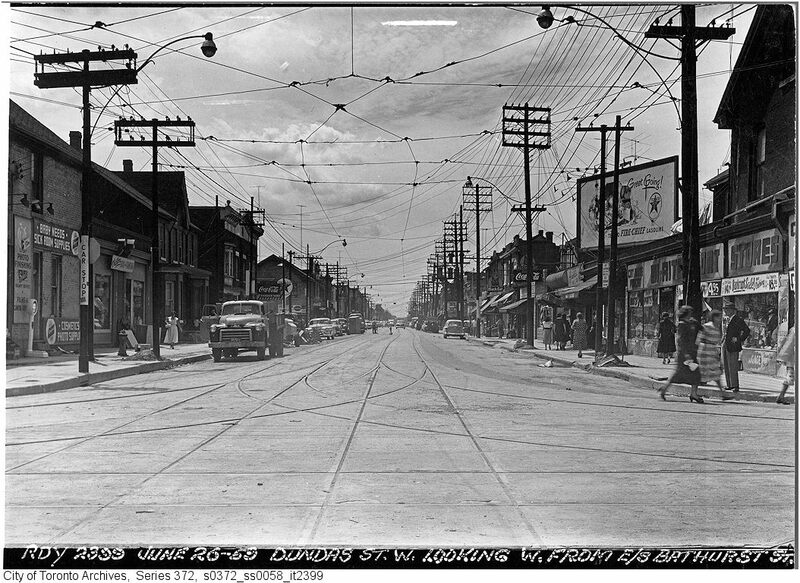 768 Dundas on the north side near Bathurst in 1936. 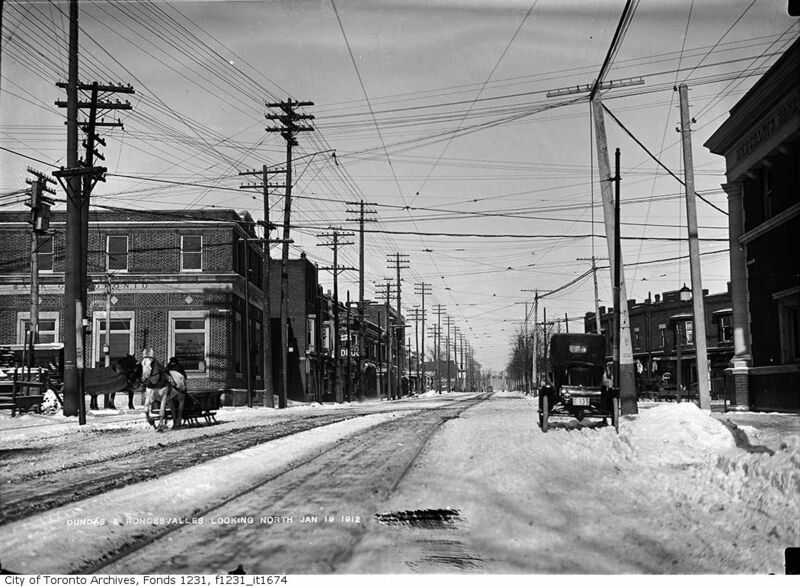 Looking north up Roncesvalles towards Bloor in 1912. 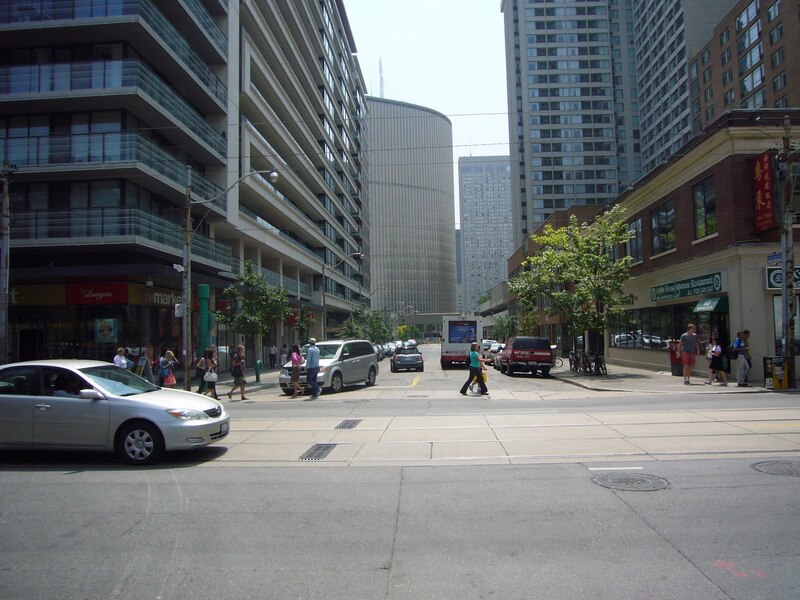 On the right is the Bank of Montreal from the previous post and on the left the Bank of Toronto. 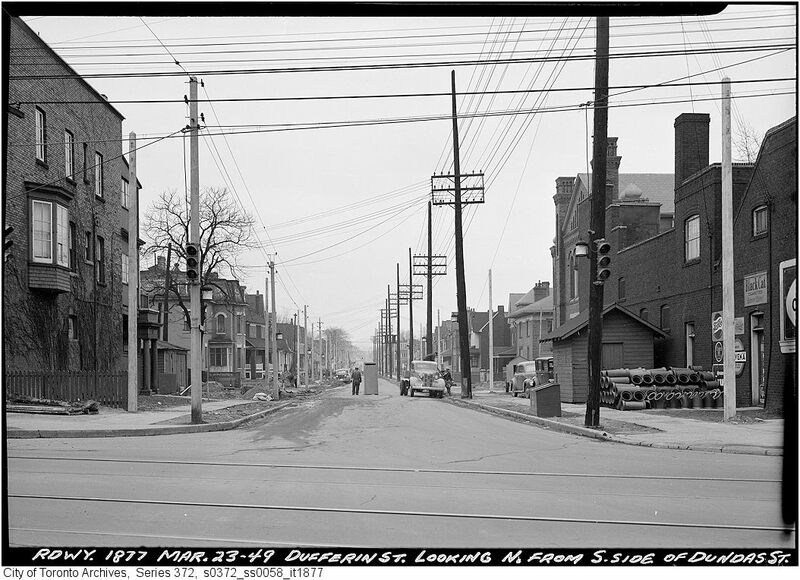 Looking east along Dundas Street West from Lansdowne Avenue in 1923. 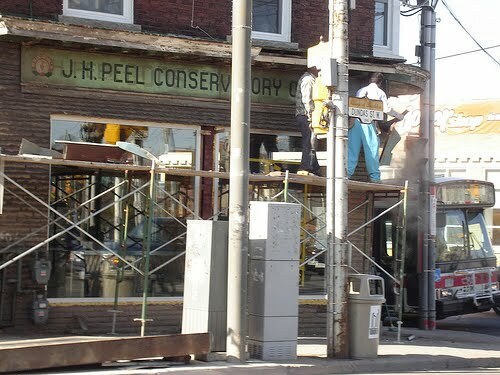 St. Helen’s Church is waiting for the steeple to be completed. 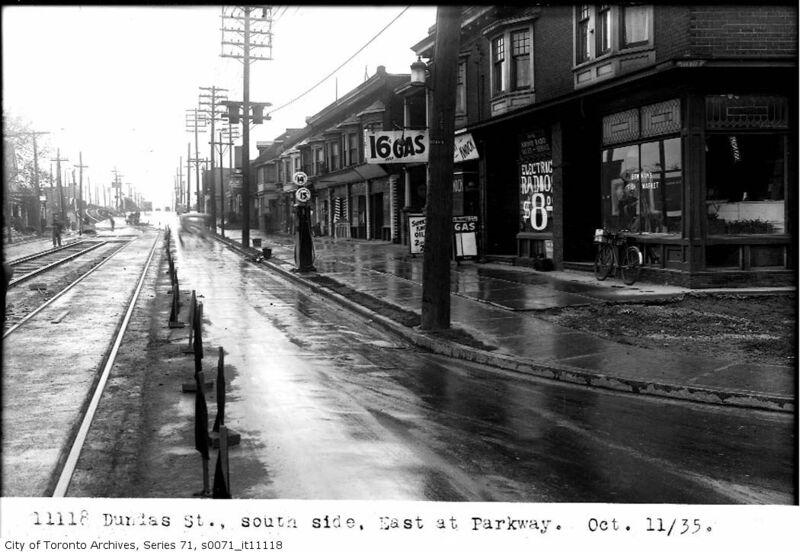 Looking west on Dundas Street West across Lansdowne Avenue 1923.